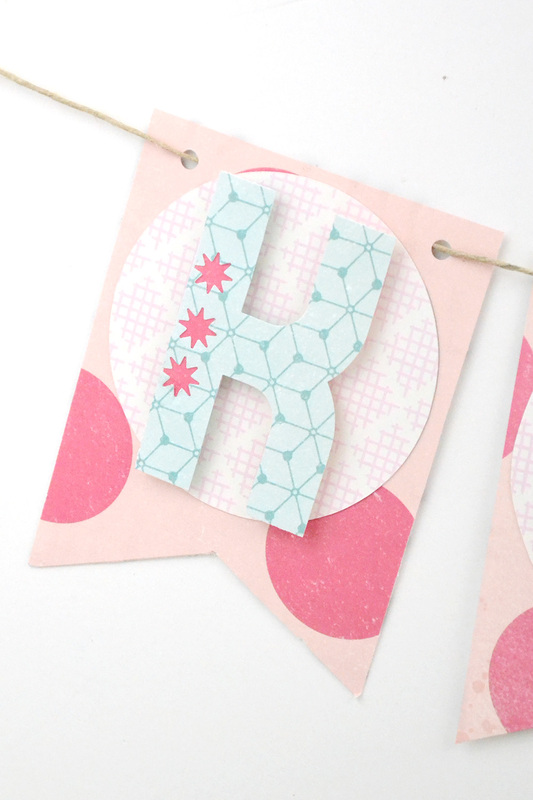 GO BIG with the DIY Party Honeycomb Pads and Stencils! Happy Monday friends, and welcome to GO BIG week here on the We R blog! This week our design team is sharing large scale projects, and how our fabulous tools make them so much easier. 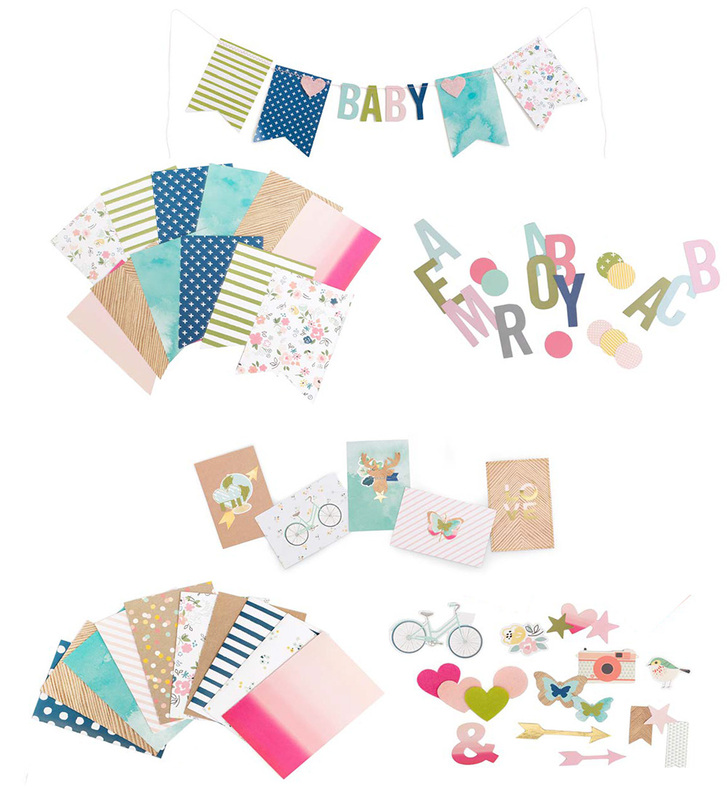 Tessa’s up first with some adorable large scale home decor! 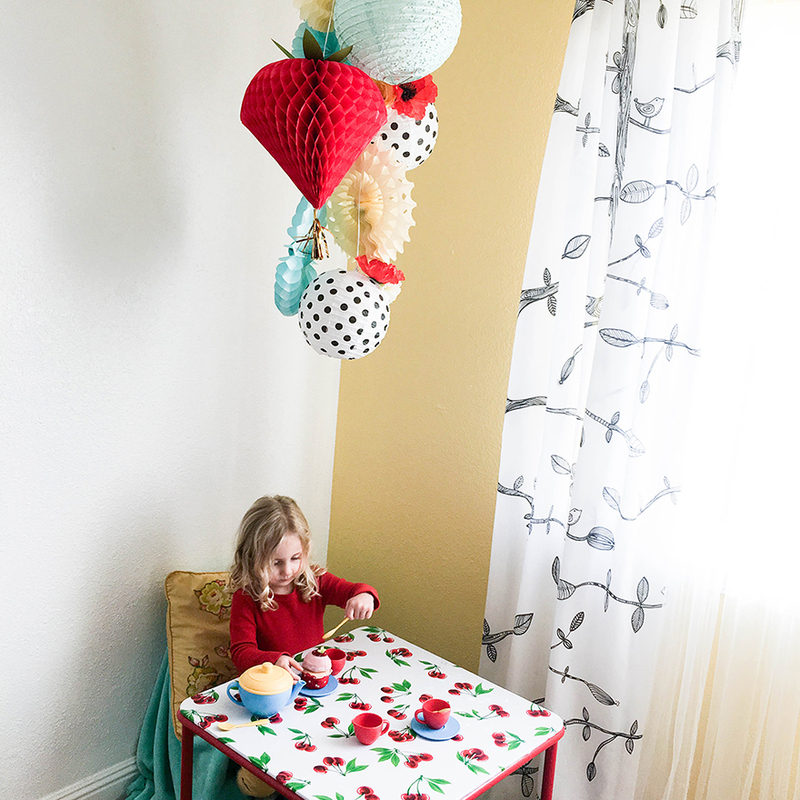 Because some of the patterns in her room feature vintage fruit designs, I decided to make a really big strawberry to be the focal point. I started with large red honeycomb paper and used the pumpkin stencil to trace the top. 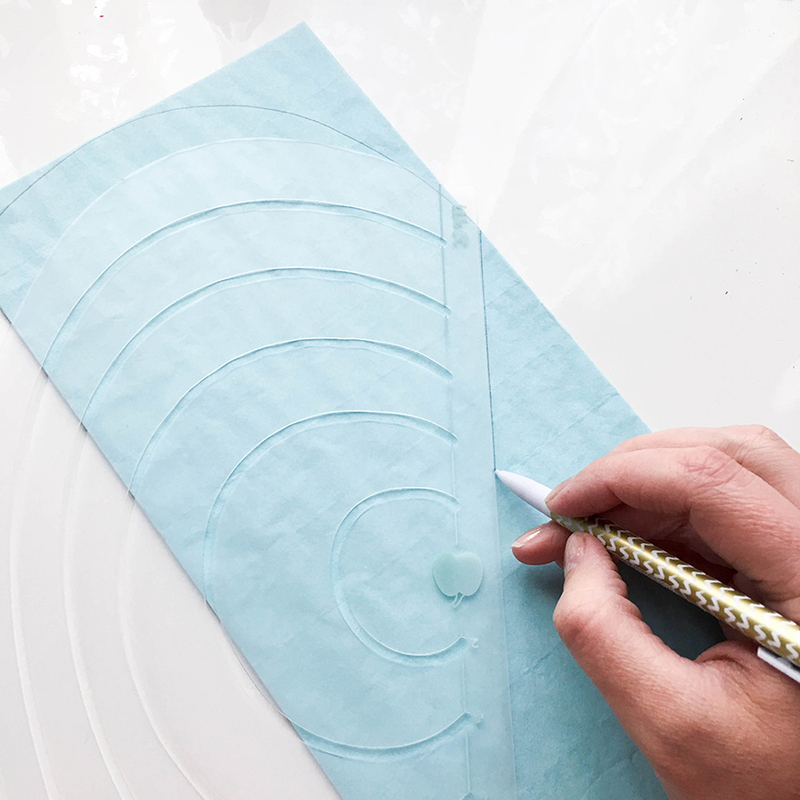 Then I used the straight edge of the stencil to draw a straight line from the curved top to the corner of the honeycomb pad. I gave the resulting heart shape green cardstock leaves to make it a strawberry. For added whimsy, I secured a gold pull tab (made for the pinatas) to the bottom of the strawberry. I was having so much fun with the honeycomb that I also made four fans, one full-size and one small in yellow and in aqua. 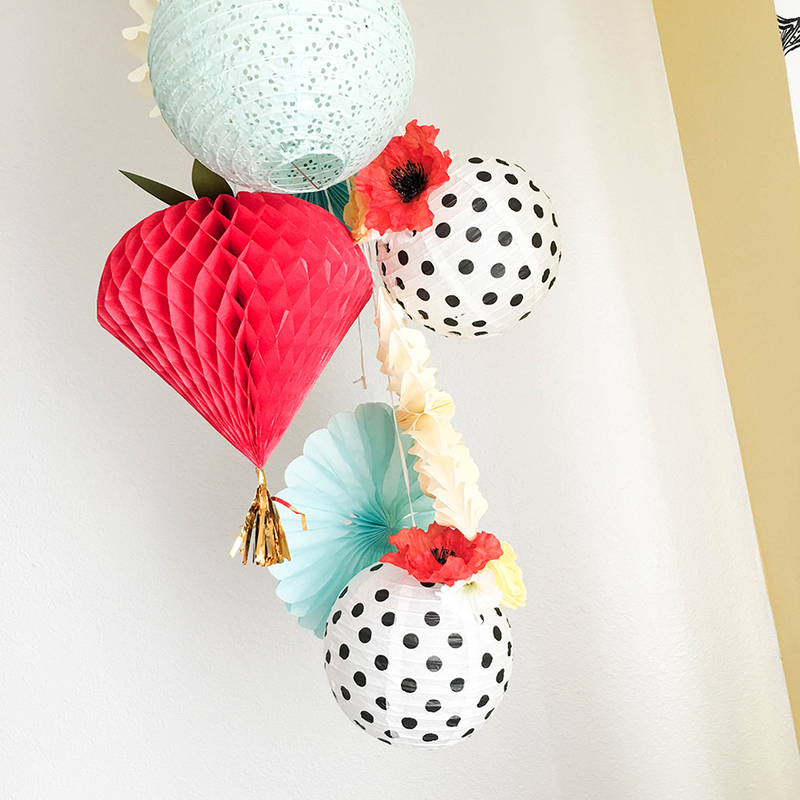 I love how the honeycomb paper makes the fans seem so light and airy – perfect for my daughter’s room! 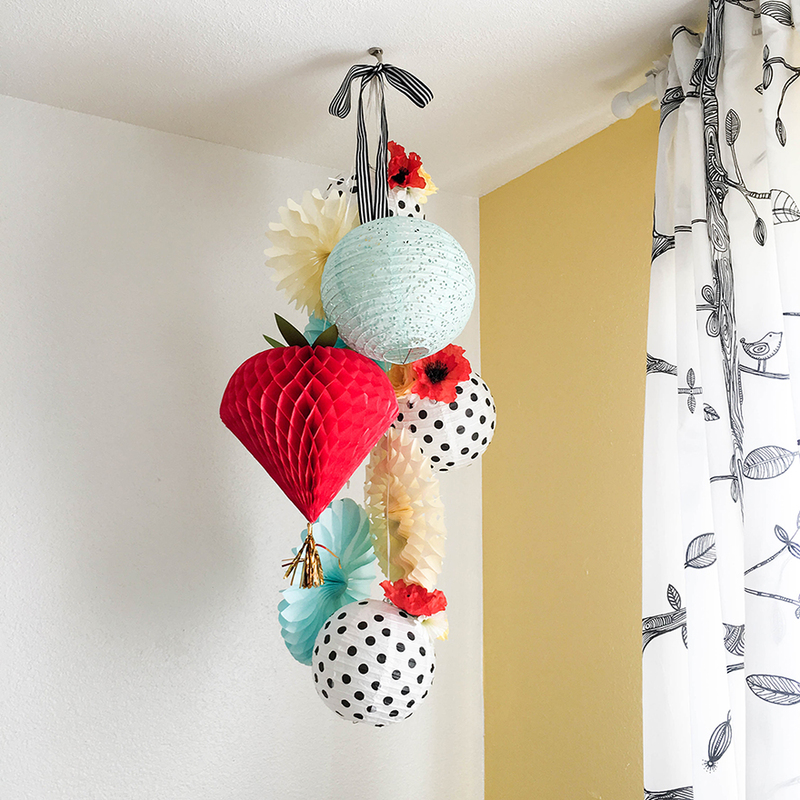 The honeycomb hangers and raffia string made it so easy to hang it all up on a plant hook anchored into her ceiling. 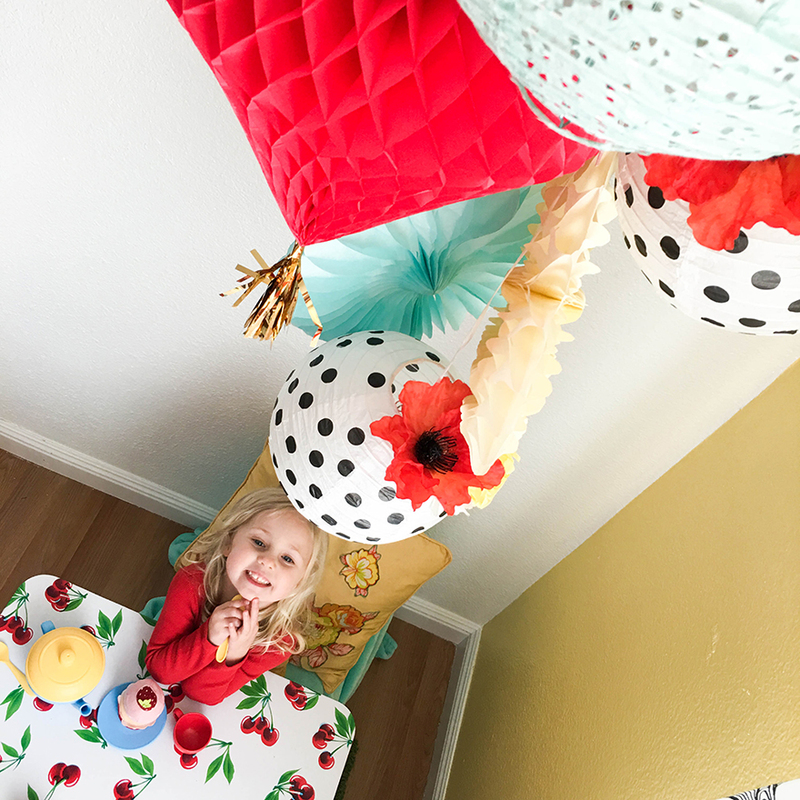 When Addie saw her room, she said, “It’s amazing, mommy!” She loves playing tea party under the fun decorations and her favorite piece is the big strawberry. 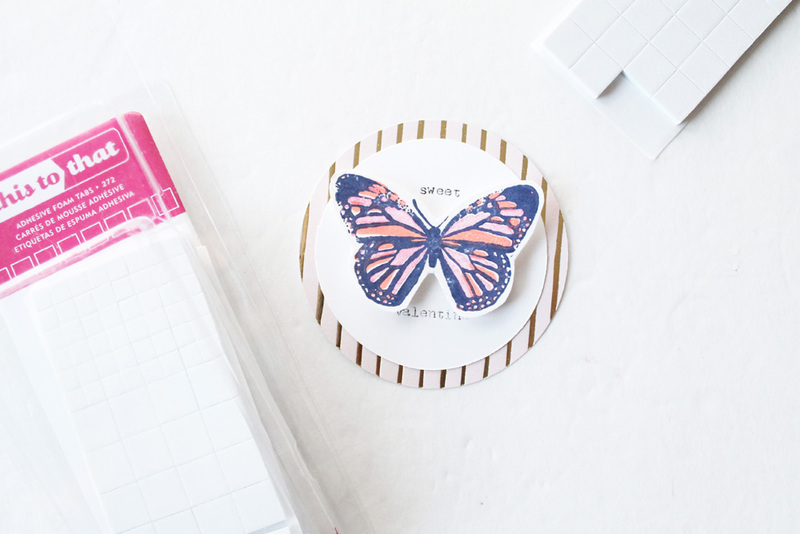 If you’re looking for some big, whimsical décor for a child’s room or some large, fruity party decorations, look no farther than We R Memory Keepers’ honeycomb pads and stencils! Happy Friday friends! 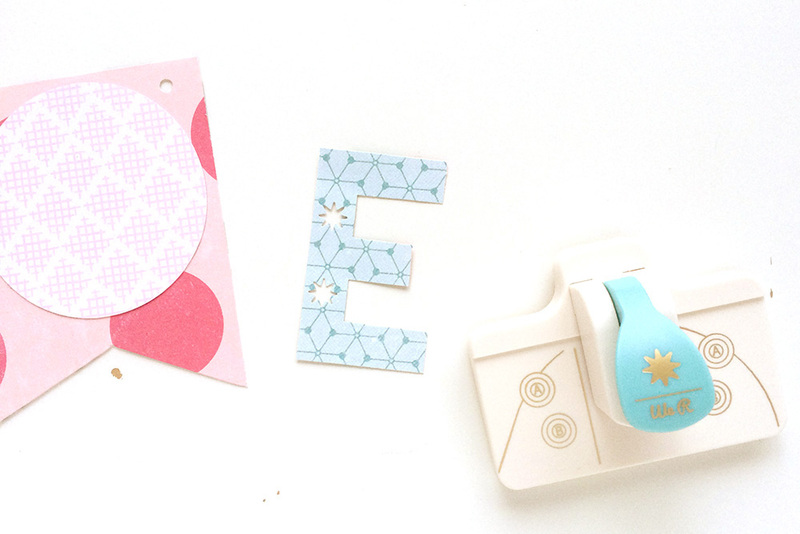 It’s Aly here, sharing a simple Valentine’s Day Banner I made with the Mini Alphabet Punch Board and one of the Font Punches. Valentine’s Day is a big deal at our house. 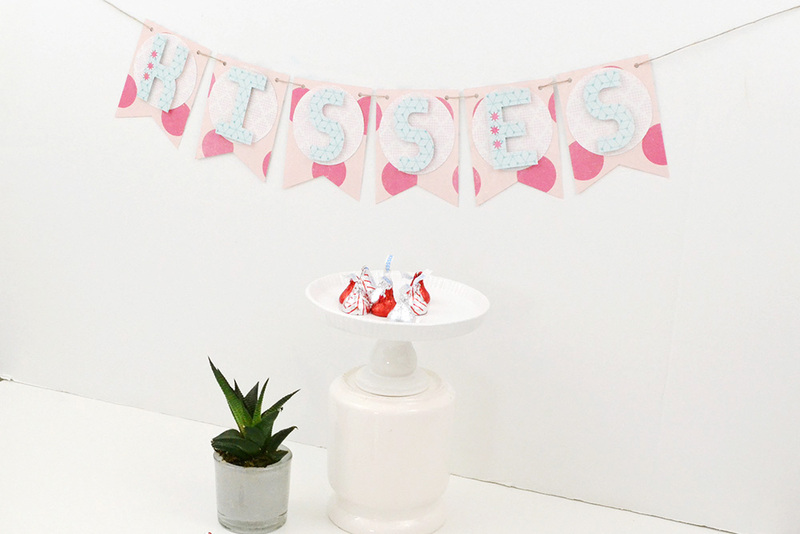 We love to decorate and celebrate, so this banner is just the beginning. 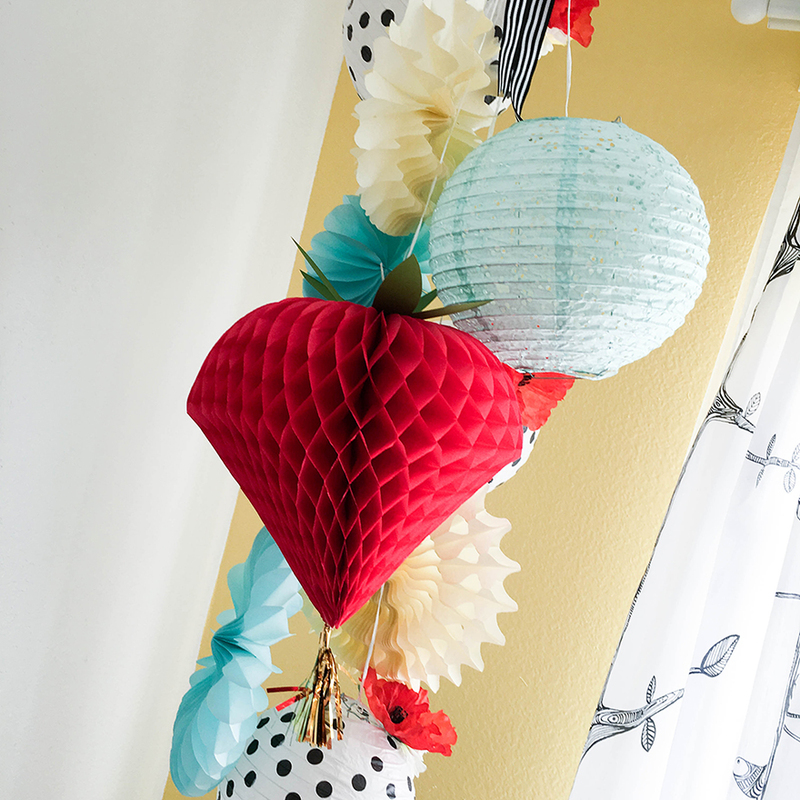 It came together quickly and easily, so now I’m ready to move on to more party decor! 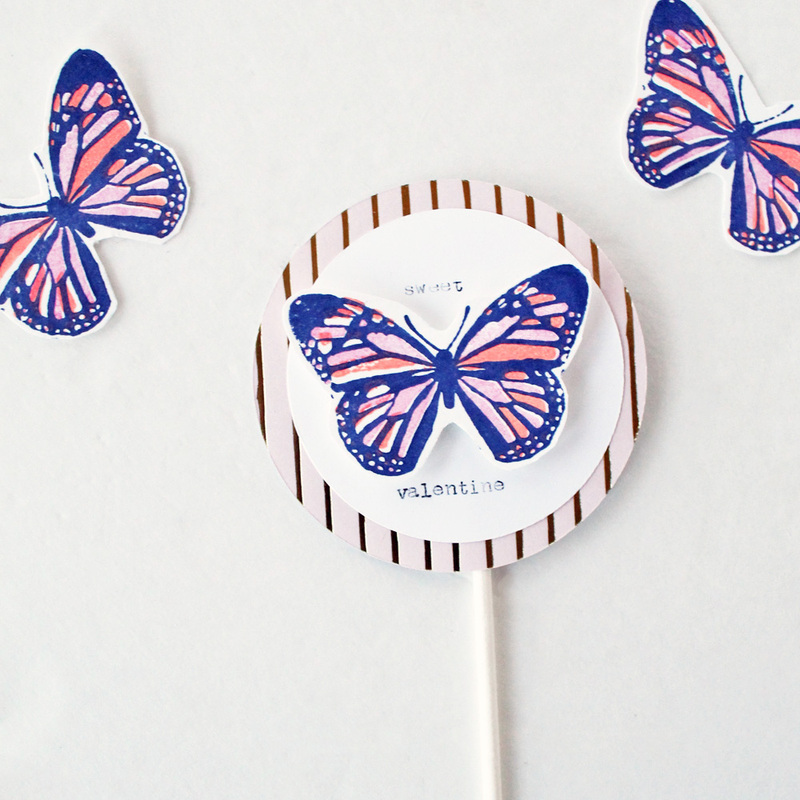 I used the “B” side of some papers from the Snow and Cocoa collection from our sister brand, Crate Paper, and used the Banner Punch Board to cut out some 3×4 inch flag banners. 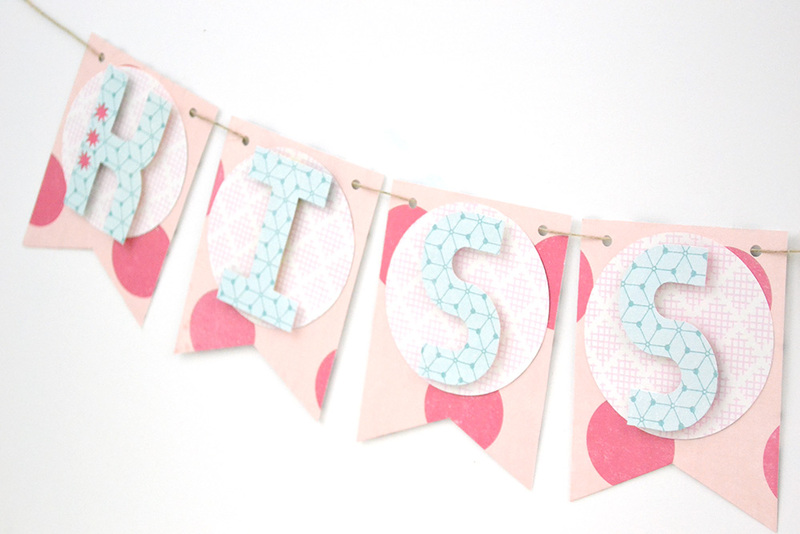 Then I cut out a 2 3/4″ circles and layered those over my banners. 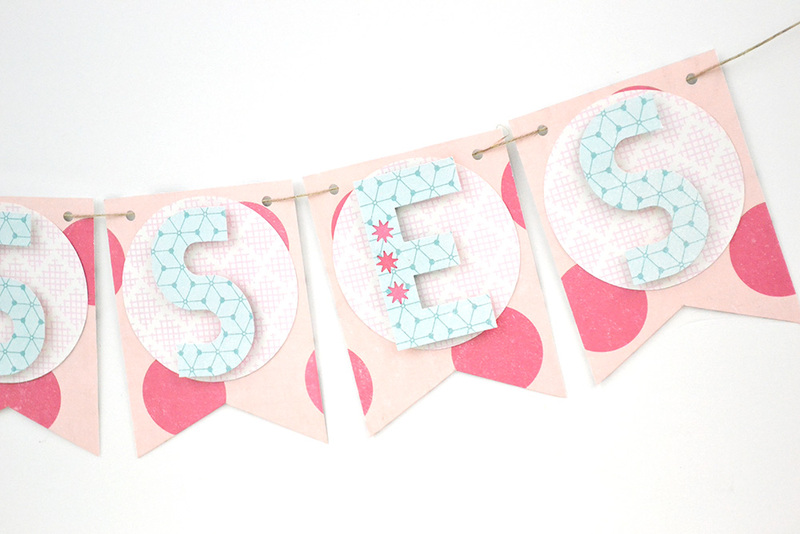 I cut some of the blue patterned paper into 1 1/2 x 2 1/2″ pieces, and used my Mini Alphabet Punch Board to spell the word “kisses”. I wanted to embellish a couple of my letters, so I grabbed one of my Font Punches, and punched a starburst shape into the “K” and the “E”. 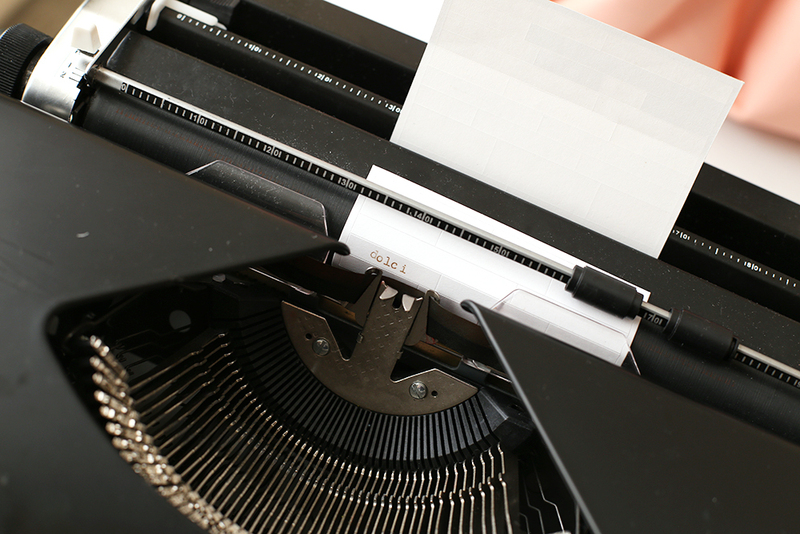 I love the extra touch that the Font Punches add to letters that I punch out with my Alphabet Punch Board. So fun! Then I backed them with some of the dark pink paper for contrast. I adhered the letters onto the banner pieces with foam squares for added dimension, and finished off my project with some jute twine for hanging. Thanks for joining me today friends! 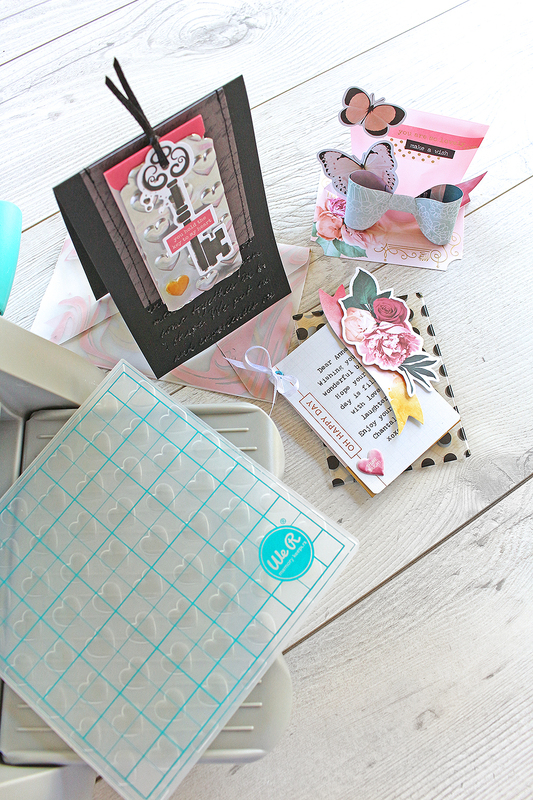 Next time you create a project with one of the Alphabet Punch Boards, be sure to pull out your Font Punches to take your projects to the next level! Happy almost Friday friends! 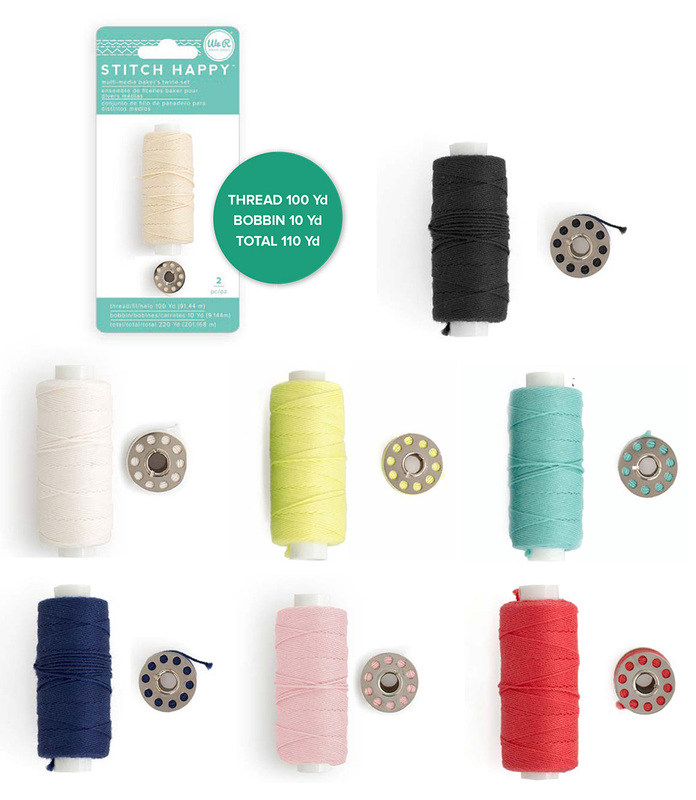 This week we’ve been focusing on using We R tools to embellish your projects. 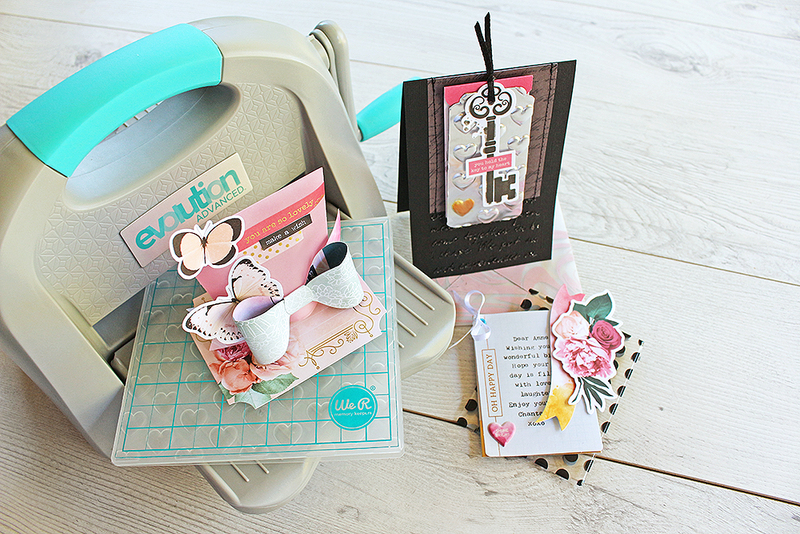 Today, we thought we’d throw it back to last year when Eva Pizarro showed us how to embellish the title on her scrapbook page with the Photo Sleeve Fuse tool and the FUSEables Collection. 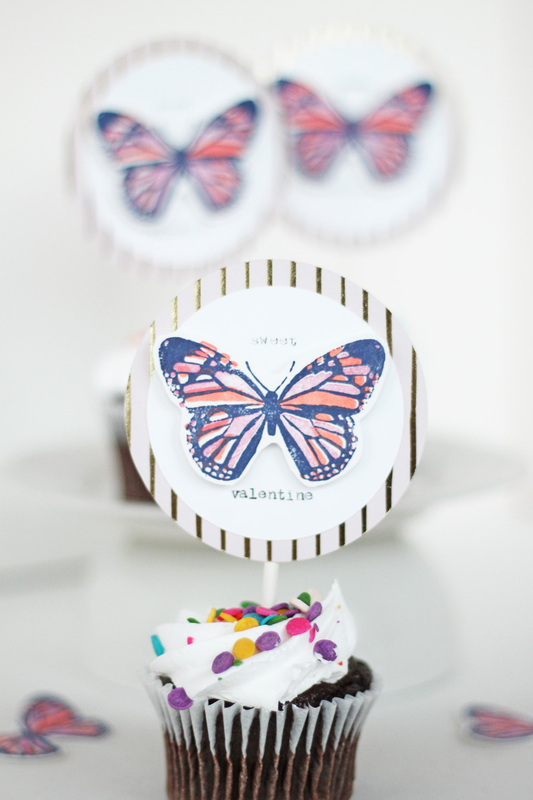 You can catch the entire post, with full instructions, on our blog HERE. 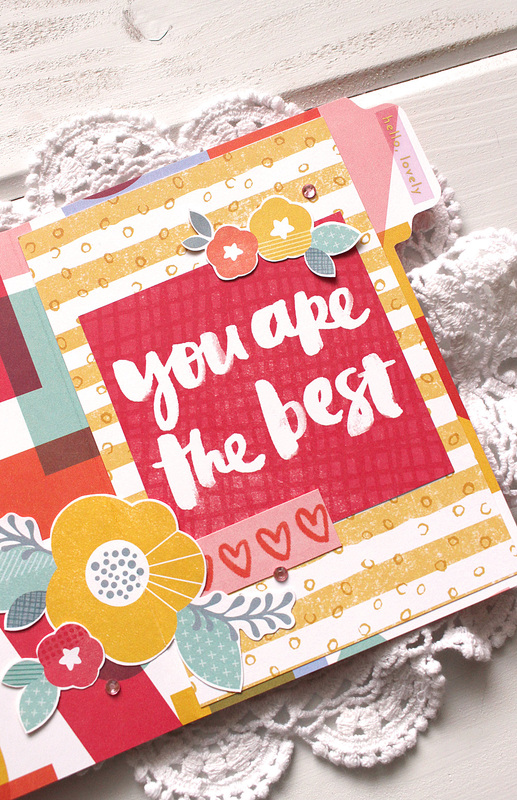 We just love how Eva layered different patterned papers from our FUSEables collection to add color to her title. Then, using the Photo Sleeve Fuse, she heat sealed some pretty sequins inside the letters of her title with clear plastic sheets. How cool is that? 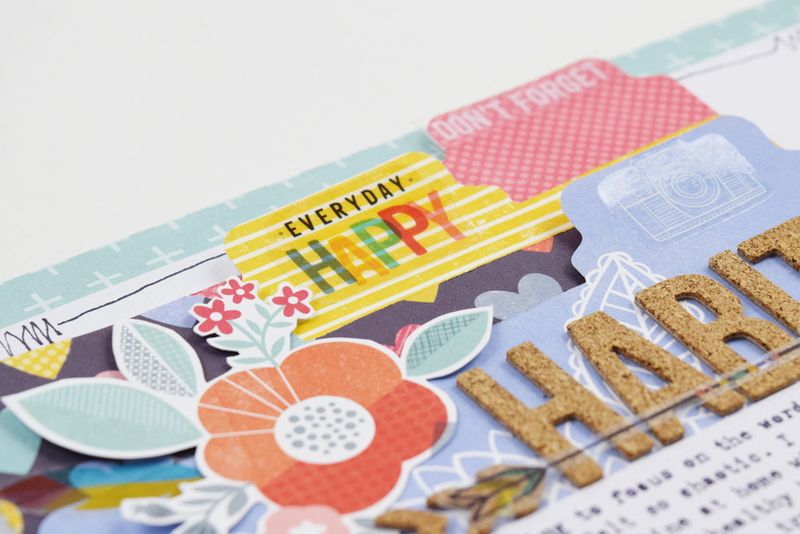 She added a FUSEables die cut heart from the ephemera pack as the center of her letter “O”. 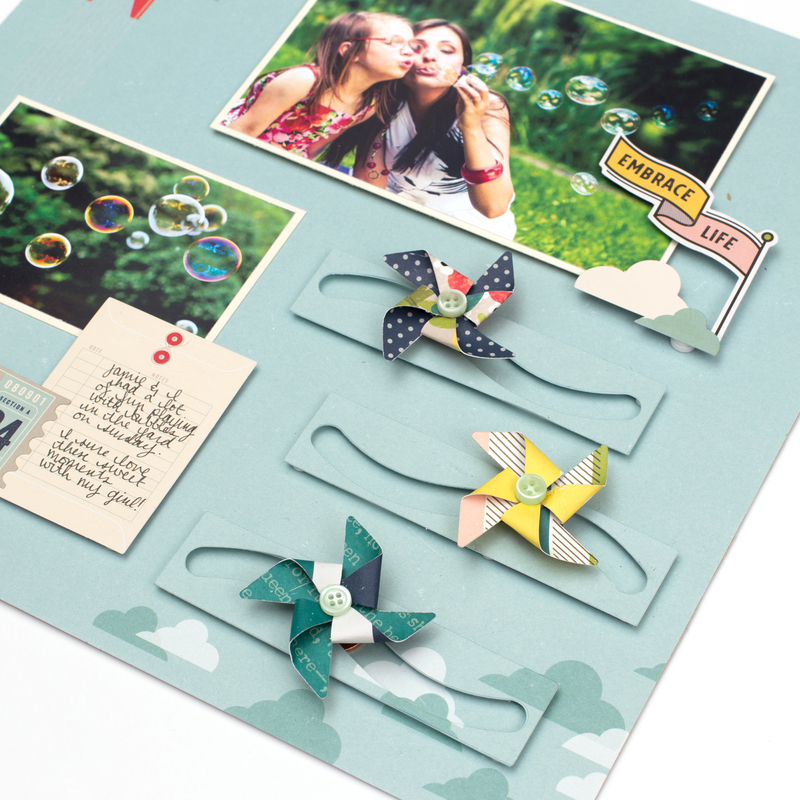 Then, she finished off her layout with some more pieces of the ephemera pack. Pretty, right? 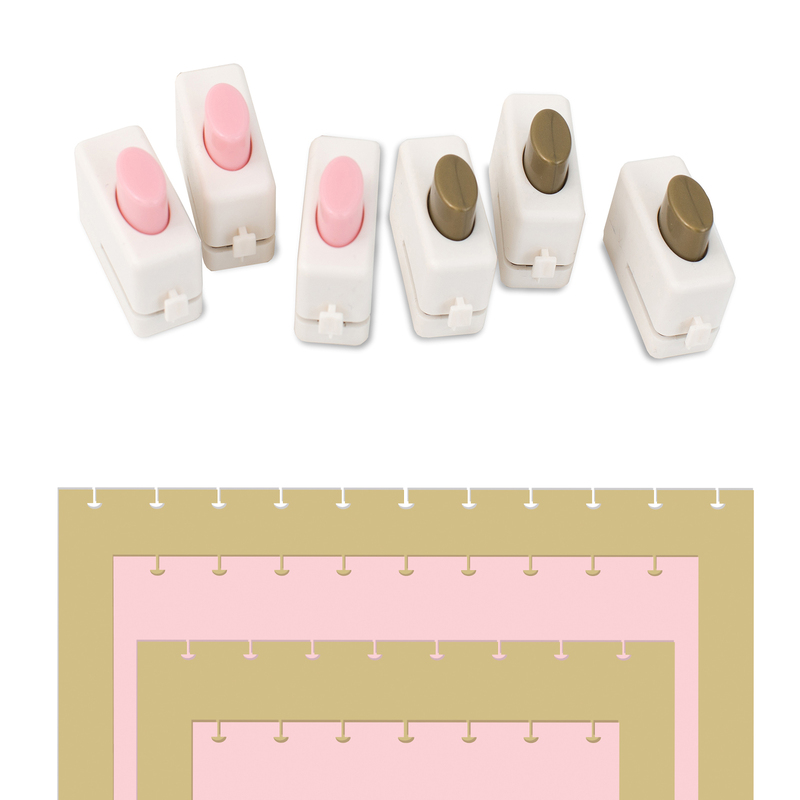 The Photo Sleeve Fuse and FUSEables collection are the perfect pair for embellishing layouts, cards, mini albums, and other paper craft projects. 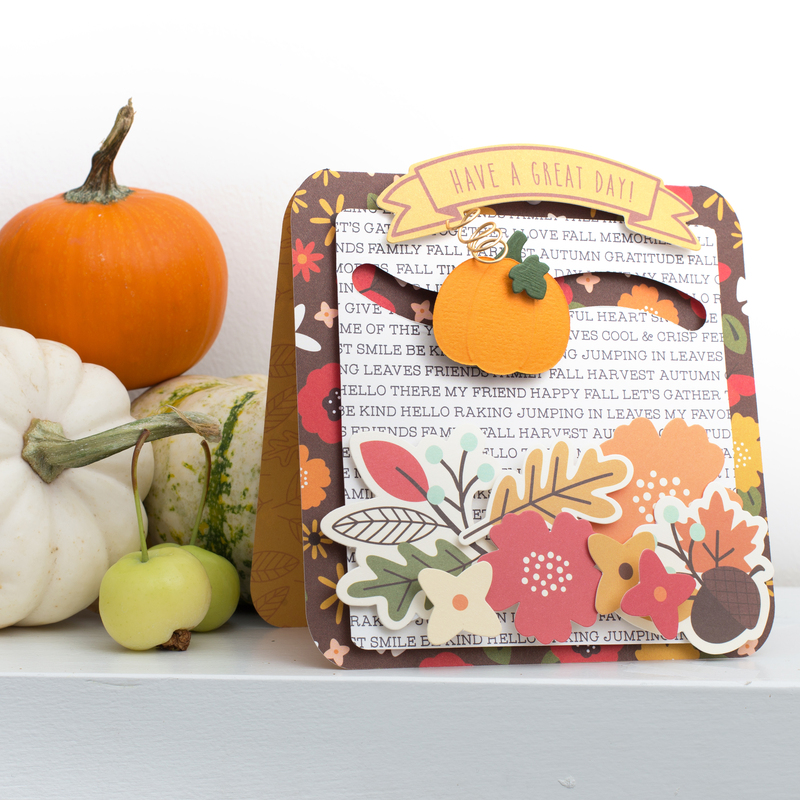 Thanks for stopping by, and be sure to check in tomorrow for a great project using the Banner Punch Board with Font Punches to embellish. See you then! Hello We R friends and Happy New Year! 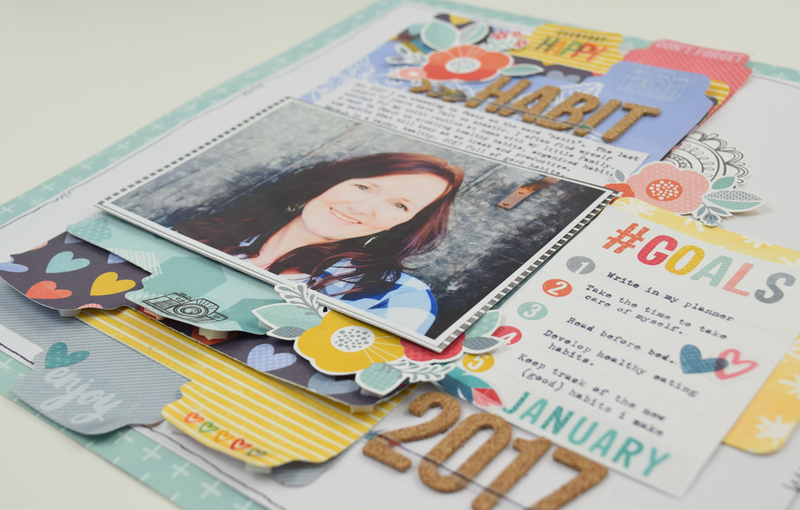 It’s Chantalle with you today and I’m so happy to be able to share some more ideas with you in 2017. Being a part of the We R Memory Keepers team continues to be a dream come true! I’ve been playing with my clever Evolution Advanced machine and created some cards with a bit of a twist. 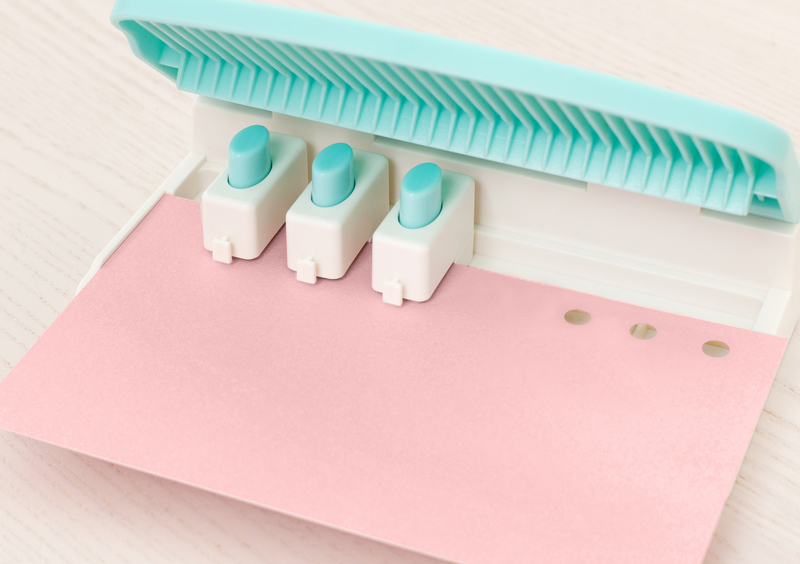 Embossing and die cutting has never been easier, thanks to the Evolution’s universal platform system. 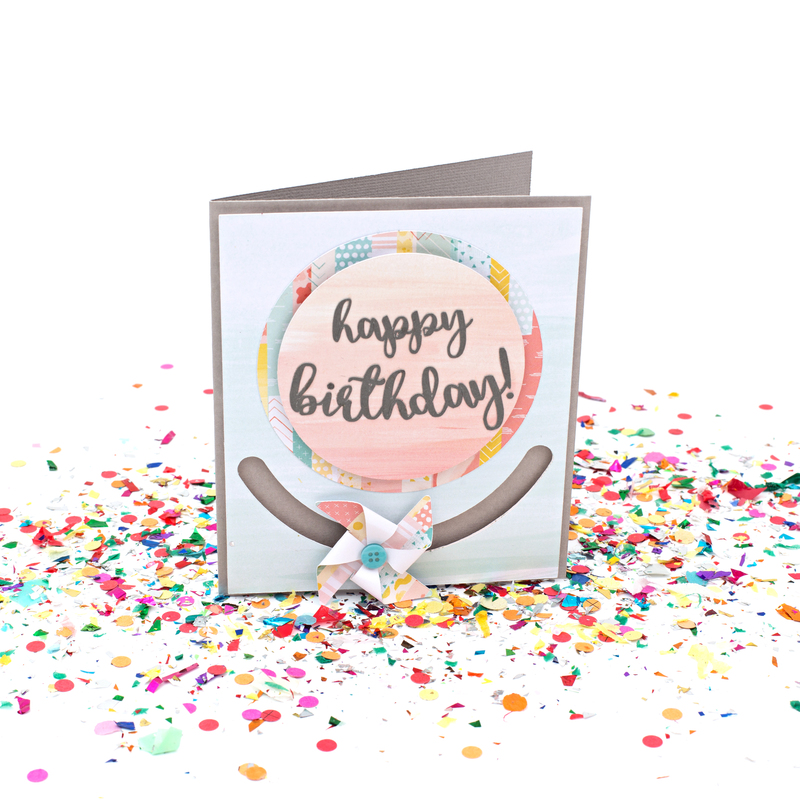 For this interactive birthday card, I have used a couple of metal die shapes – a Bow and a part of the new Gift Card Holder die set. I folded the sleeve up and taped it shut on three sides, as per the fold guides. 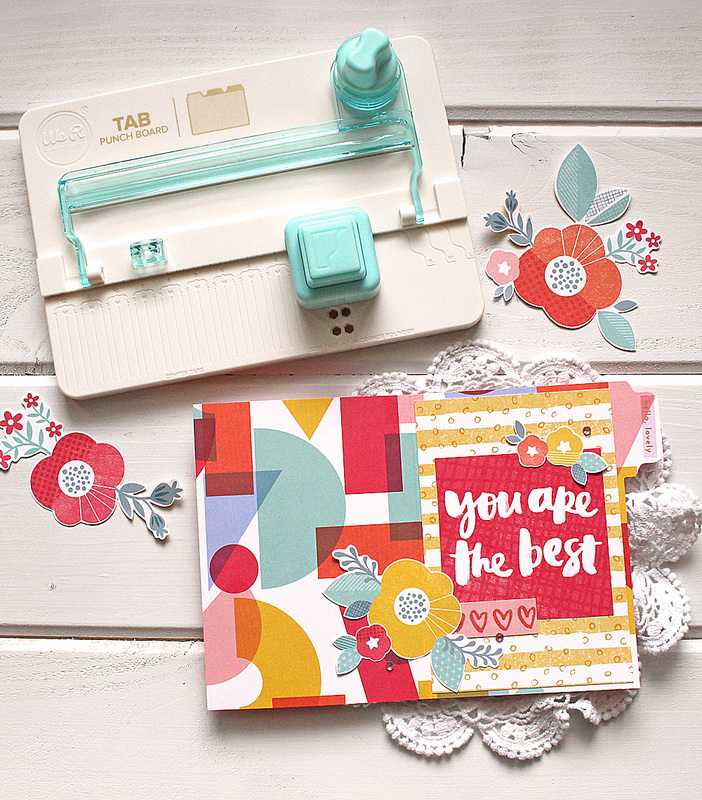 The sleeve has been embellished with some beautiful ‘Moonstruck’ Washi Stickers and Ephemera from Pink Paislee. 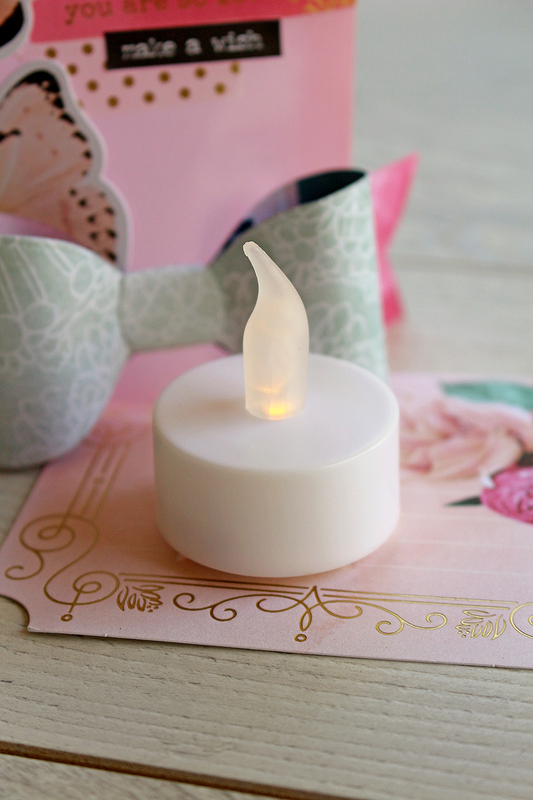 The sleeve lifts off to reveal a little battery operated birthday candle. Make a wish! I’ve adhered the candle to a Moonstruck journalling card from the Ephemera pack. Underneath, I marked out where the switch for the candle sat and used my kraft knife to carefully cut out the area, enabling the receiver to switch the candle off when not in use. 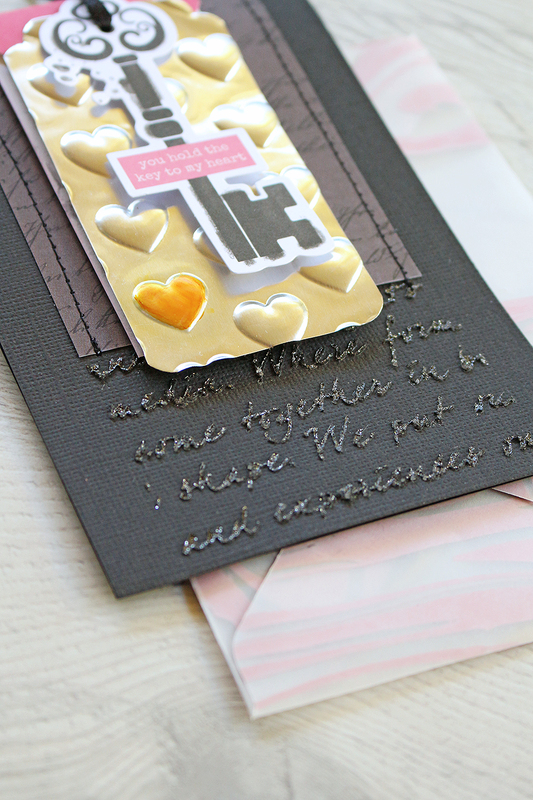 My next card makes use of a bit of embossing. 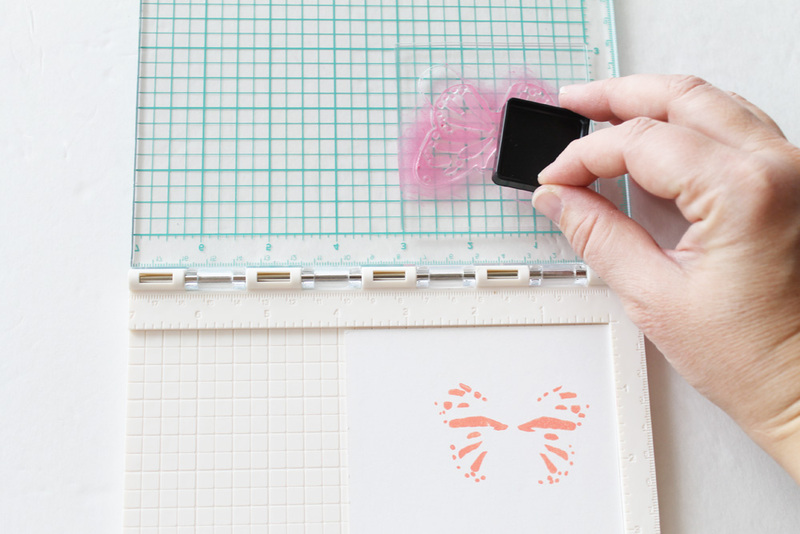 Did you know that you can use your Next Level Embossing Folders with more than just paper? 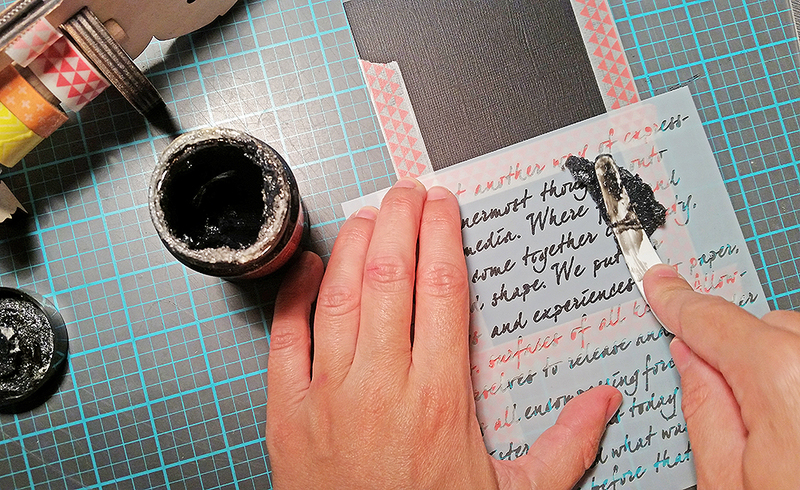 I remember using this technique in a class I taught once, which was super fun! 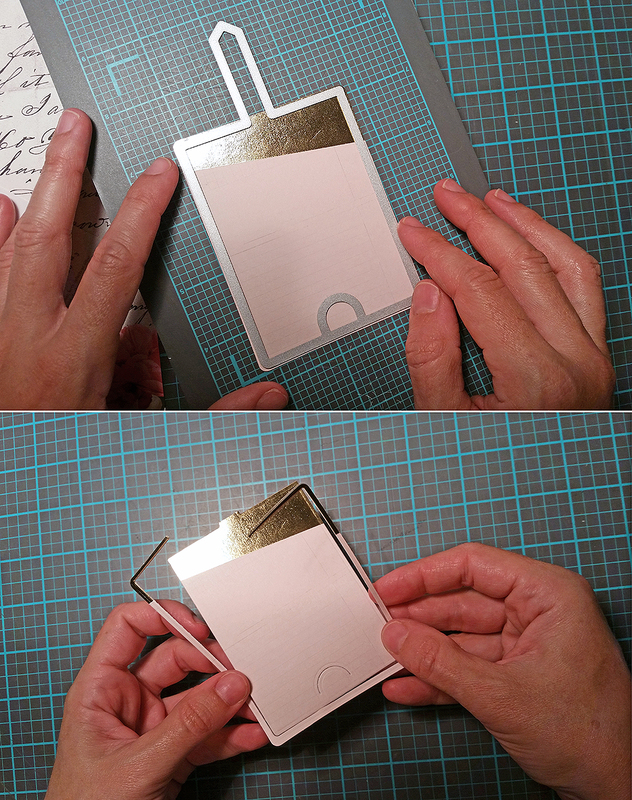 I’ve cut down a sheet of thin metal into about business card size. 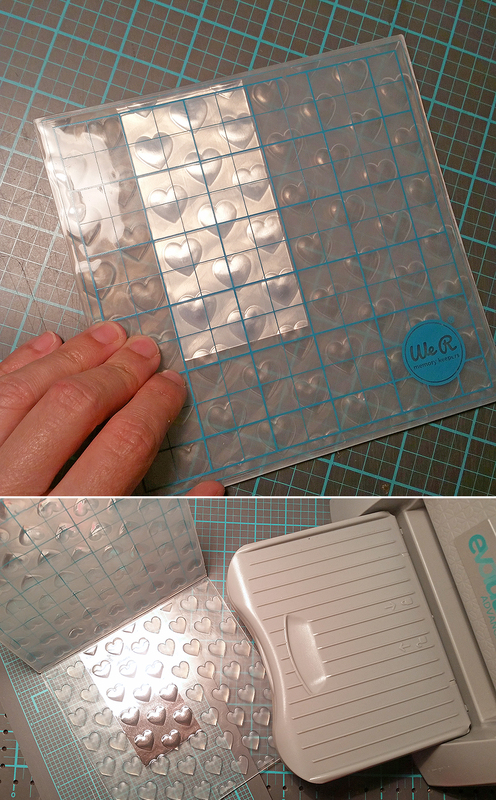 I then placed this inside my Heart embossing folder and ran it through my Evolution. Doesn’t it look fabulous! One of the hearts has been given a splash of colour with an alcohol marker. 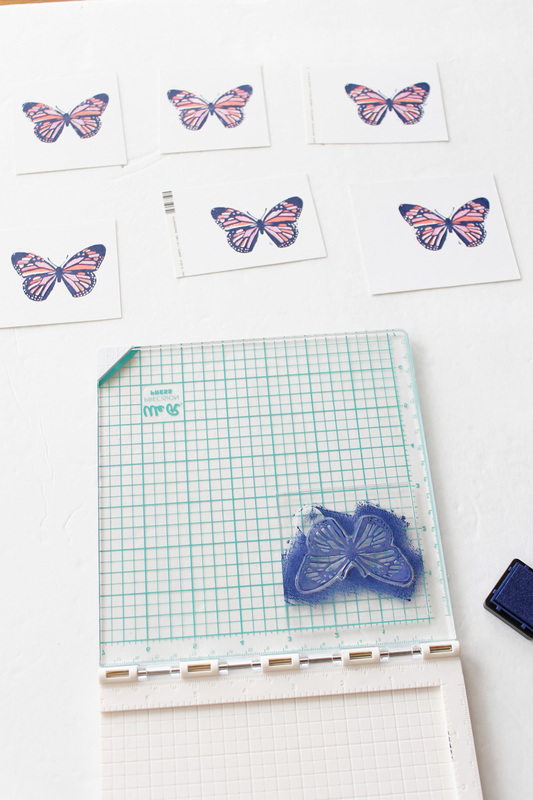 Note: This cute embossing folder comes in a twin pack with a dot pattern one as well. To finish off my shining tag, I used my Crop-a-Dile to punch a hole near the top. I then used my Crop-A–Dile Scallop/Stub Corner Chomper tool to give the top corners a decorative edge. 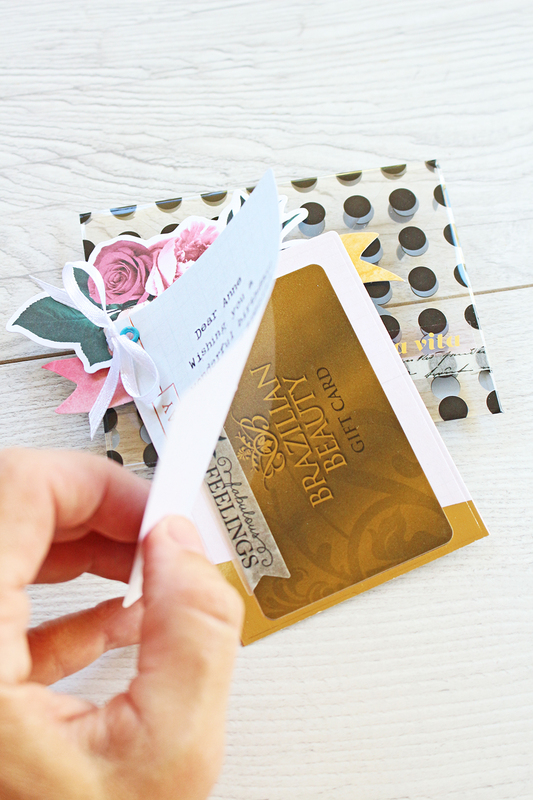 The tag was finished off with a bit of thin black ribbon and a coordinating tag, created with one of my favourite tools – the DIY Tag Punch. My tags were placed onto some black cardstock, over which I have adhered a 3×4 journalling element, cut from a sheet of #1 Moonstruck 12×12 paper. To echo the dark script print I’ve used on my card, I have used some black glitter texture paste through a script stencil. The ends of my ribbon were also given a professional finish, thanks to my Ribbon Cutter. 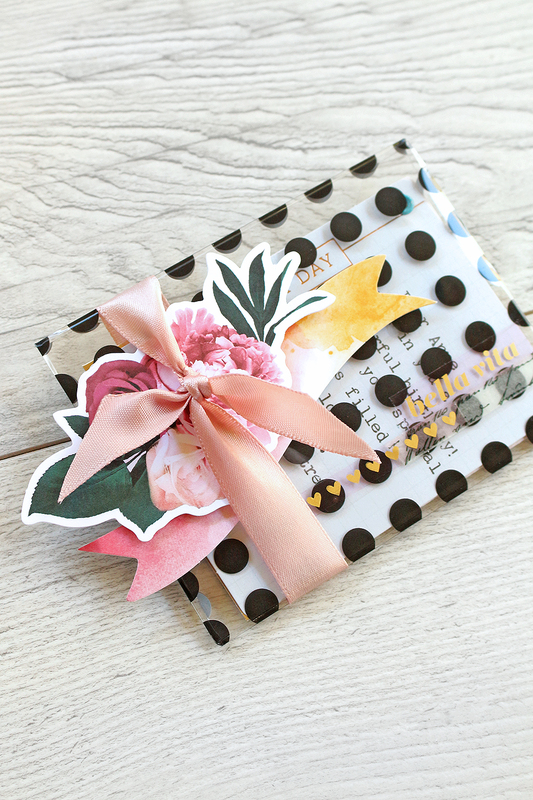 If you use a lot of ribbon on your projects you will love how easy it is to cut and seal your end pieces on giftwrap or bows etc. I love that one can grab a sneak peek of what’s inside the envelope. 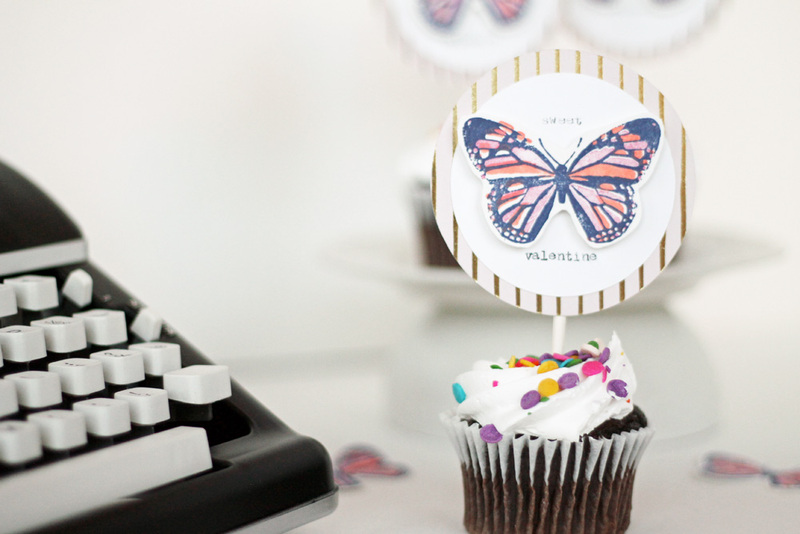 I’ve typed up a personalized birthday wish for a friend directly on to the journaling card, using my Typecast Typewriter. 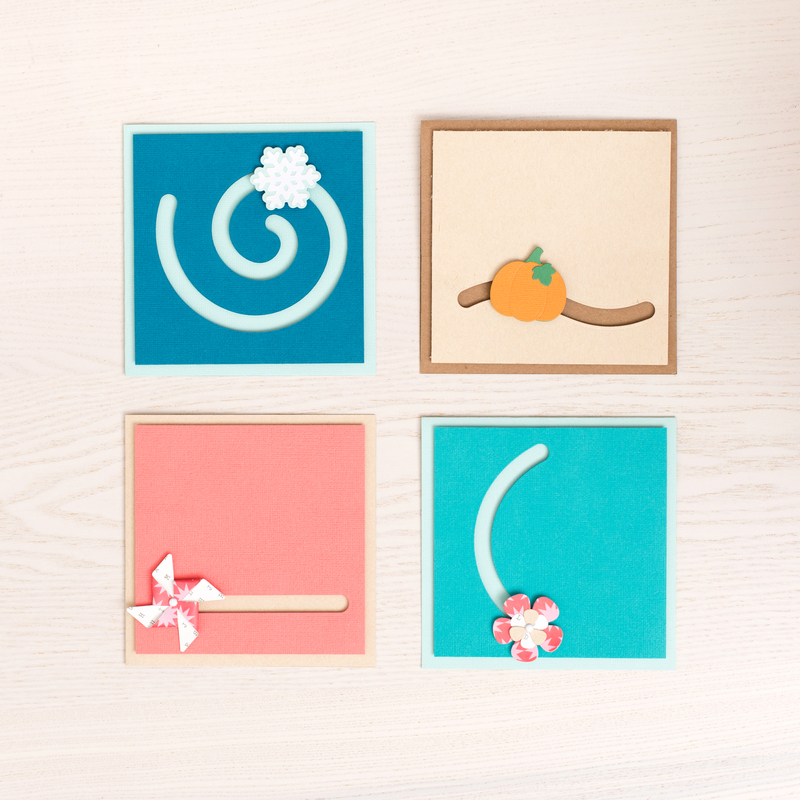 Below the note is another journaling card, which I have cut to a specific shape to hold a special treat, in the form of a gift card. 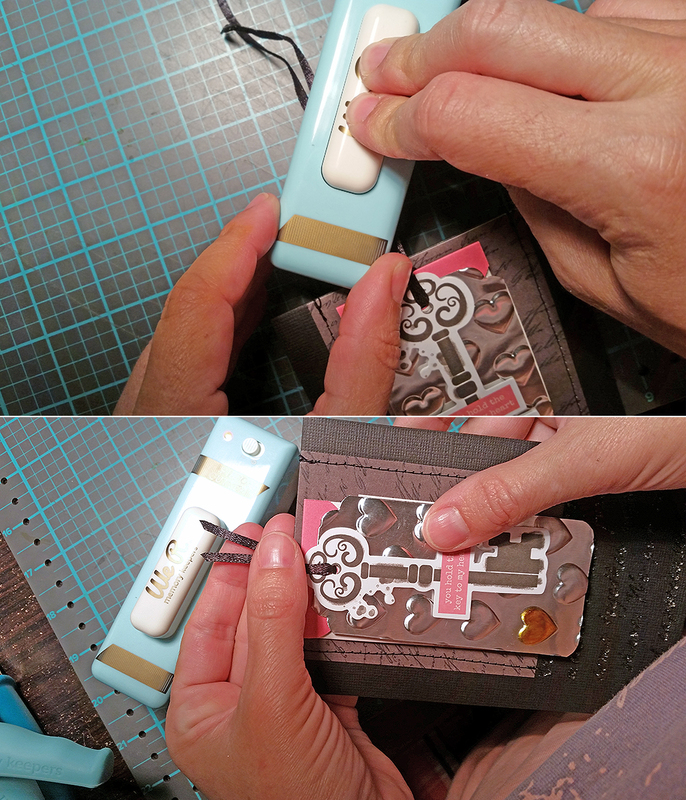 Using the same Gift Card Holder die set from earlier, I went about die cutting, with only the bottom bit of the die set, which has the notch area to hold a card as shown below. Pop a card into the notch and you’re all set to give a great gift! The top note and bottom card holder have been joined together with an eyelet, set by my Crop-A-Dile. 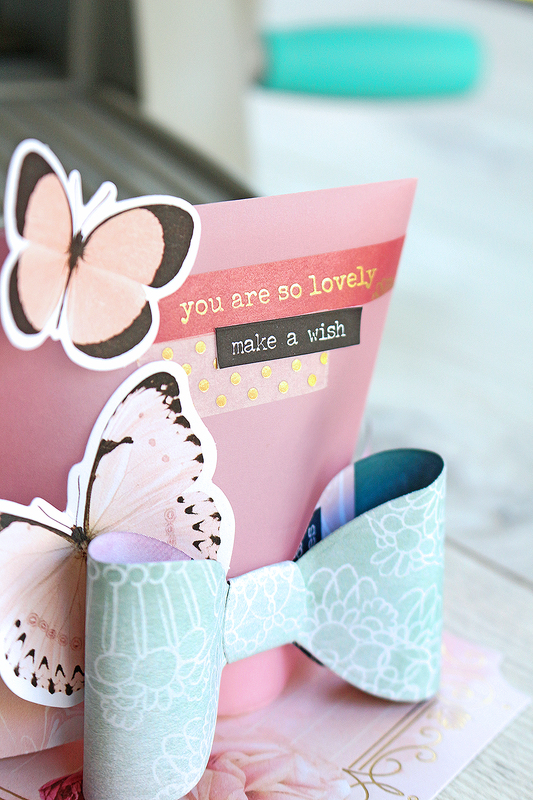 I hope these ideas will inspire you to try a different take on your next special card. Thank you for joining me today. Hello there! 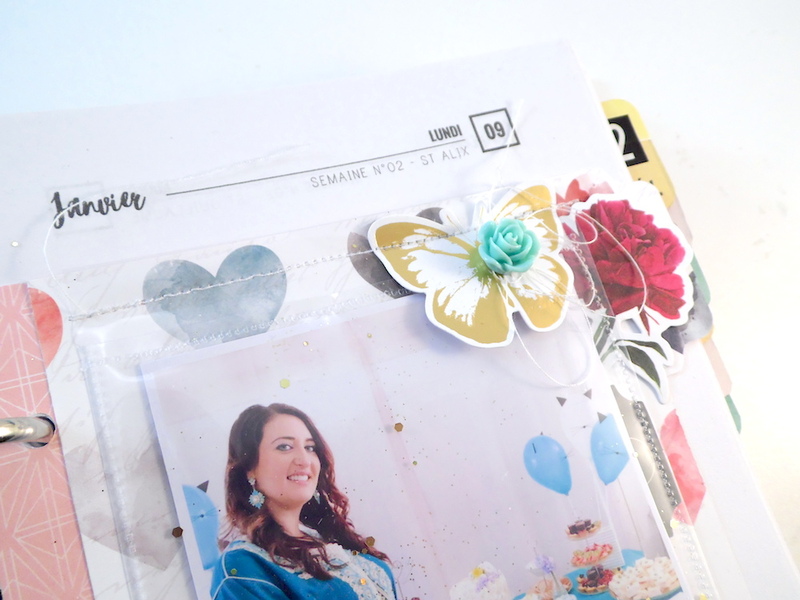 Soraya here to share with you a fun and creative planner spread using the fantastic We R Memory Keepers new release, the Tab Punch Board, and my favorite tool so far, the Photo Sleeve Fuse! 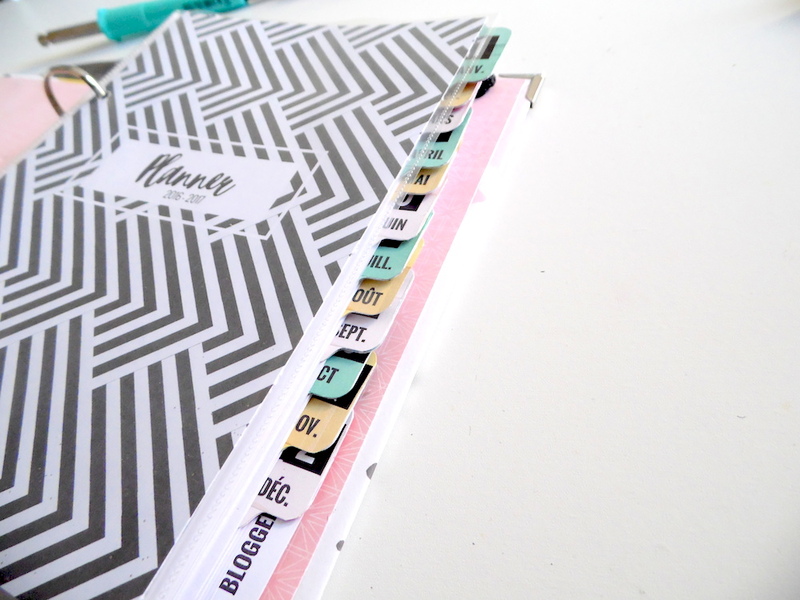 I love using my planner to organize my everyday life, but also to document the best moments. 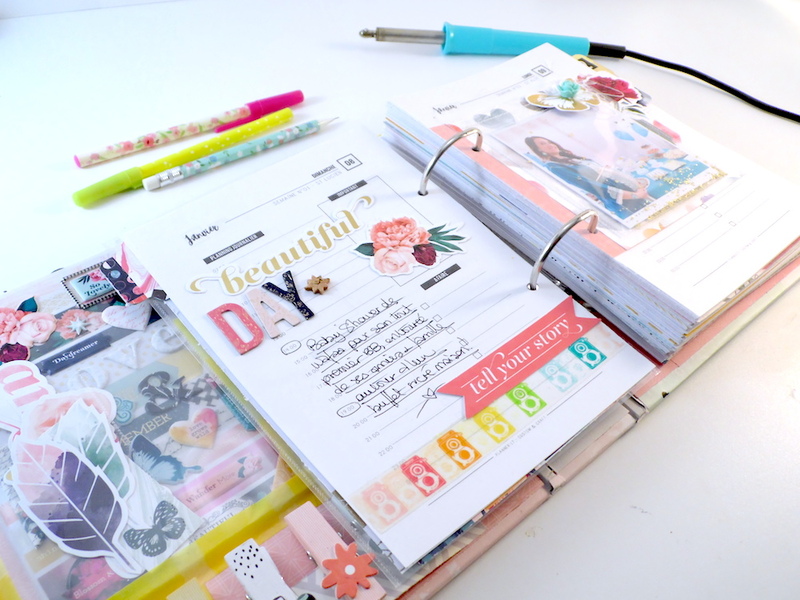 And as a scrapbooker I can’t resist adding more journaling and embellishments to my planner spreads! 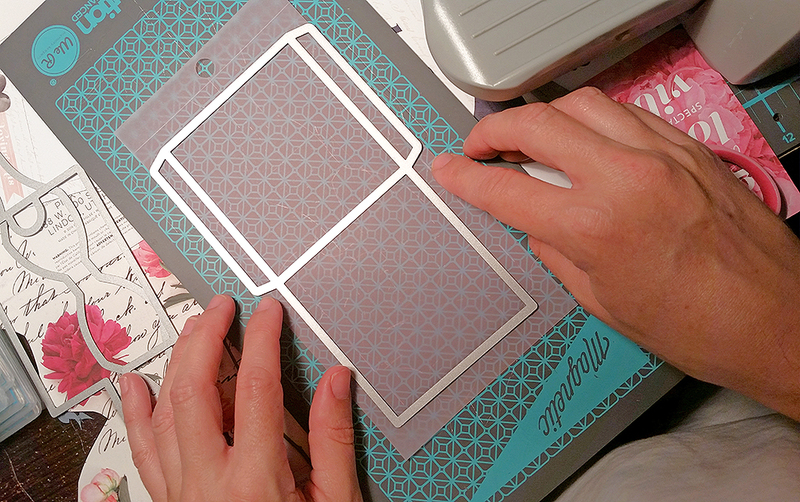 So today I wanted to show you how I created the dividers of my planners with the Tab Punch Board. So easy and so fun! 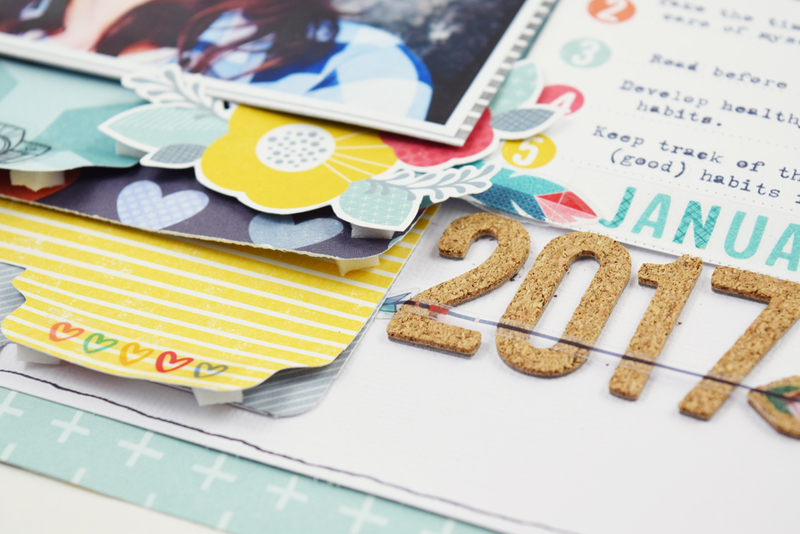 First of all I selected 12 different patterned papers to fit the 12 months of the year. Then I used the Tab Punch Board to create all the tabs. I used the small size so that they can all fit on the edge of my planner. And finally, I punched again 12 tabs to layer them on the dividers and to decorate with months and numbers. 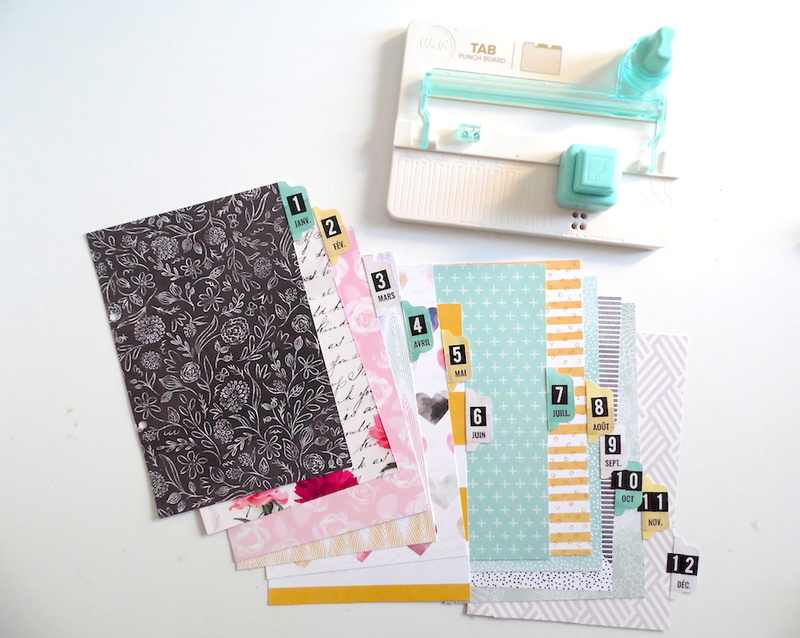 I love the result–each month has its own patterned divider! 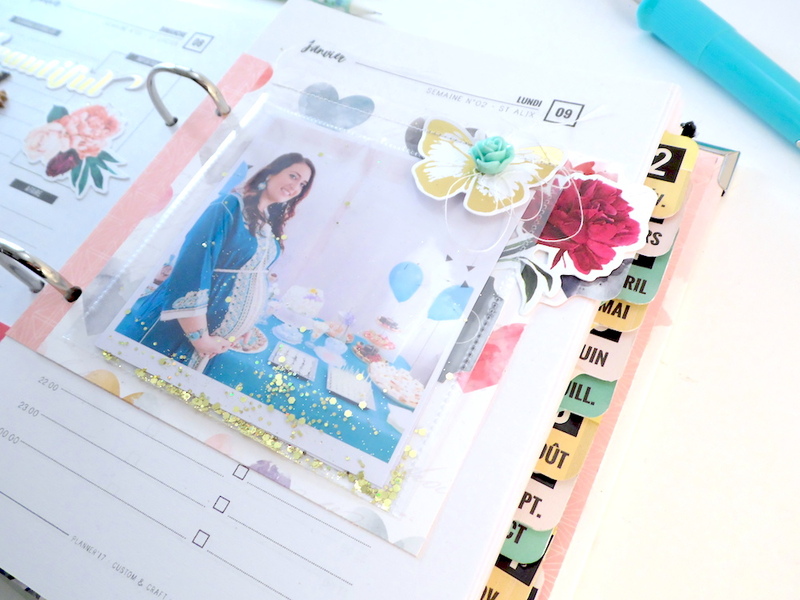 Now for the planner spread! I used the Fuse Tool and one waterfall sleeve (4x4in) to create a glitter photo pocket. 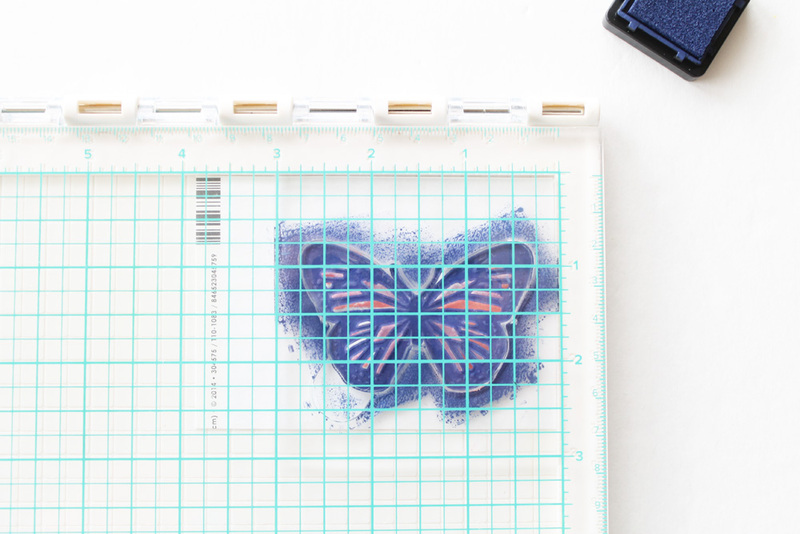 How exciting is it to add sparkles and pockets to your planner? Love it! 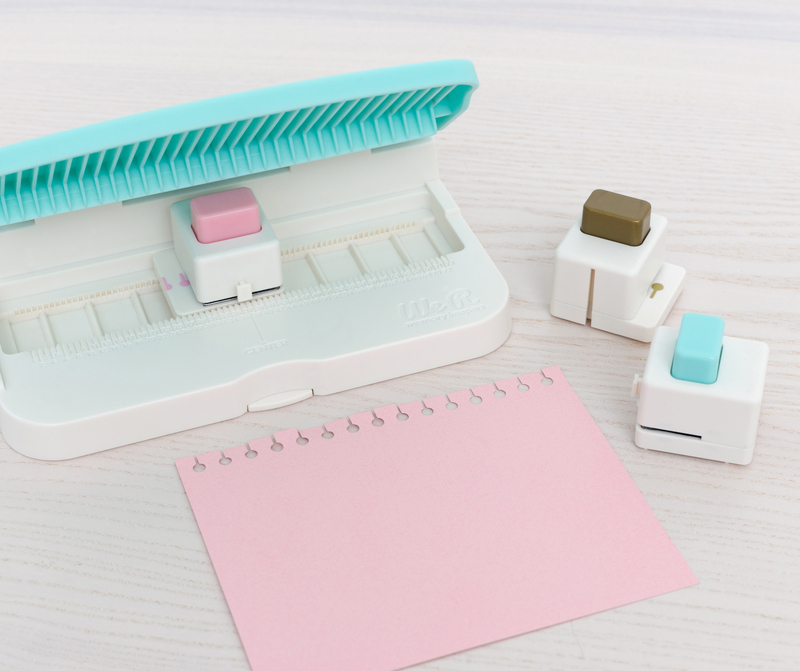 The Tab Punch Board is not only perfect to create dividers or tabs, it’s also a great tool to use if you want to organize your planner board! 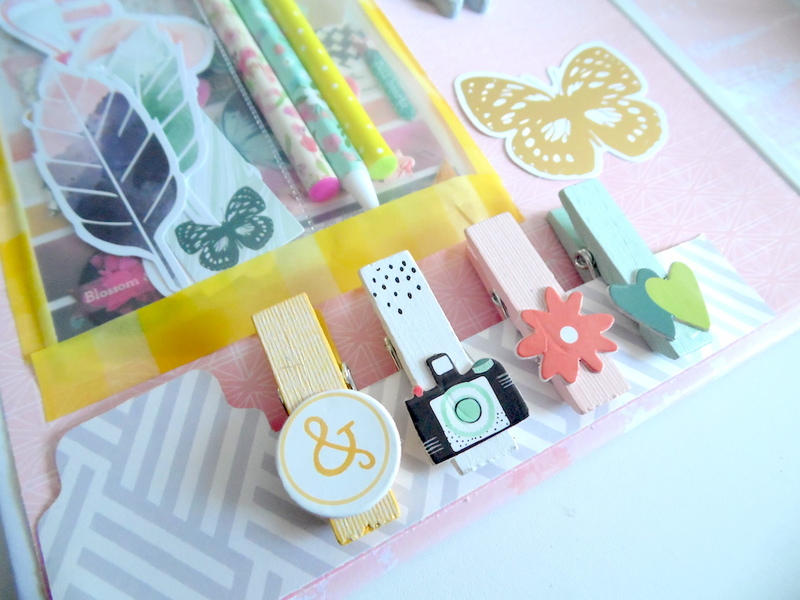 This is how I used a tab to set my wooden paper clips! So cool! 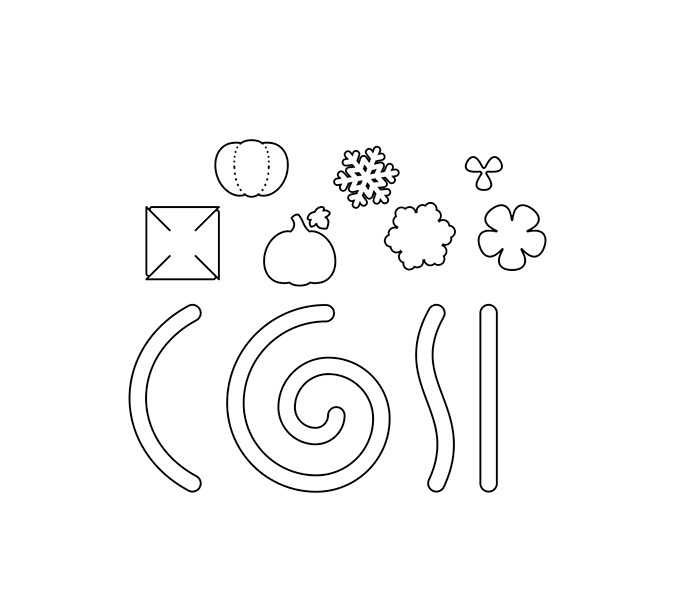 Thank you so much for joining me today for my first project! 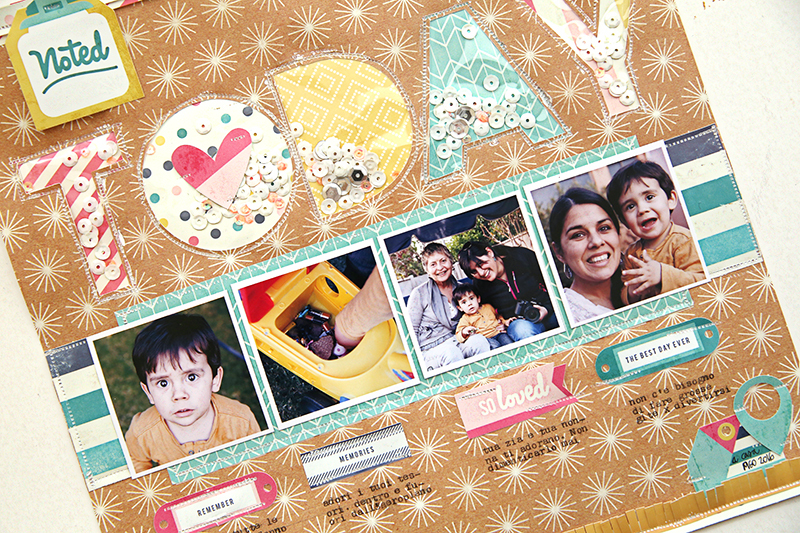 Have fun creating with the Tab Punch Board, you will love it for sure! Hello everyone! 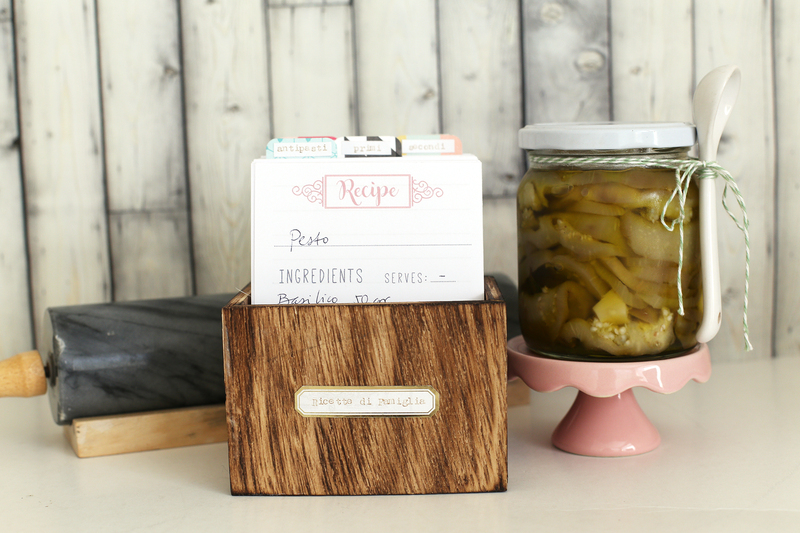 It’s Eva Pizarro here on the blog today showing you a project to organize your recipes made with the new Tab Punch Board, and sharing a free printable recipe card for you. My husband is Italian and in his family food is really important. It is more than a meal, it is a tradition. My mother in law and my husband’s grandmother are amazing cooks, they know how to do everything. A few years ago I decided I wanted to learn a few of their recipes. 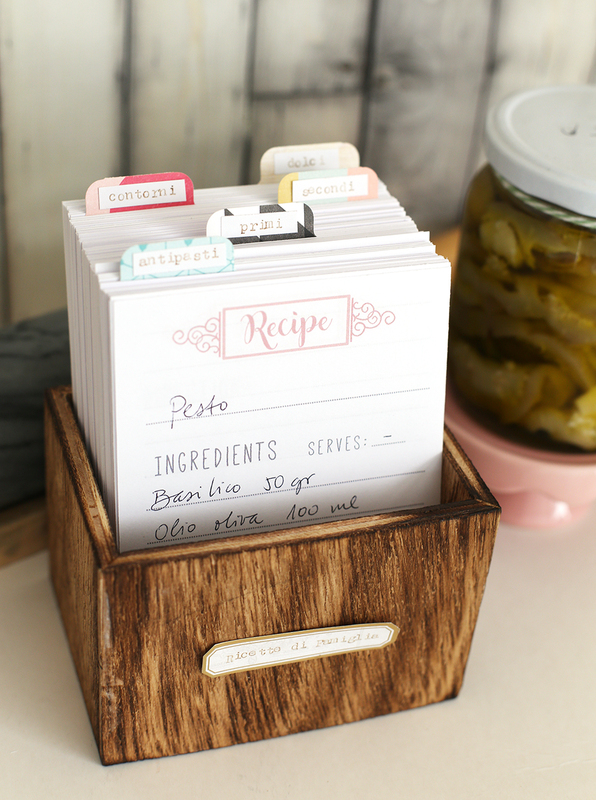 This little Recipe Box is helping me get organized and not lose any of those precious recipes. 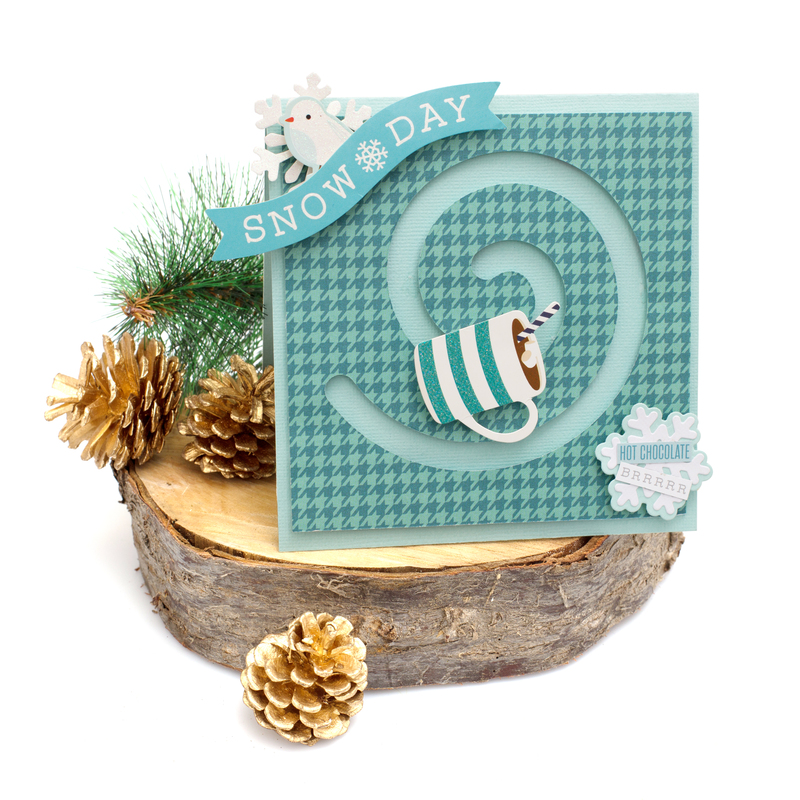 I made the tabs with papers from the lovely Snow & Cocoa collection by Crate Paper. 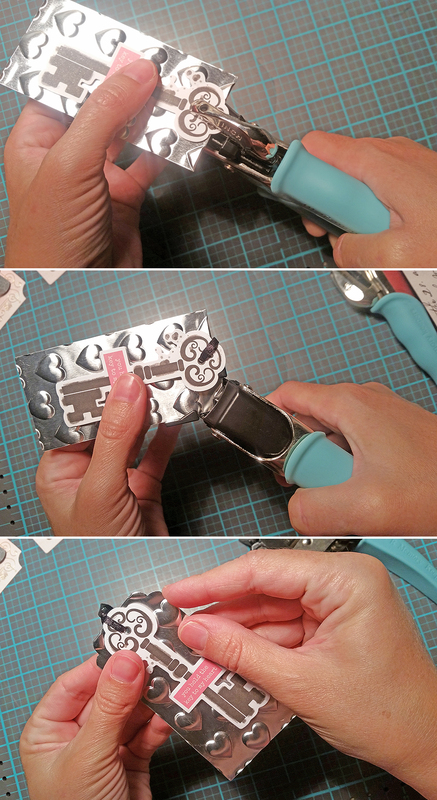 To make the tabs simply punch on the corner of your paper, flip it and punch on desired width (I chose “S”), then use the cutting track to cut off the excess paper. 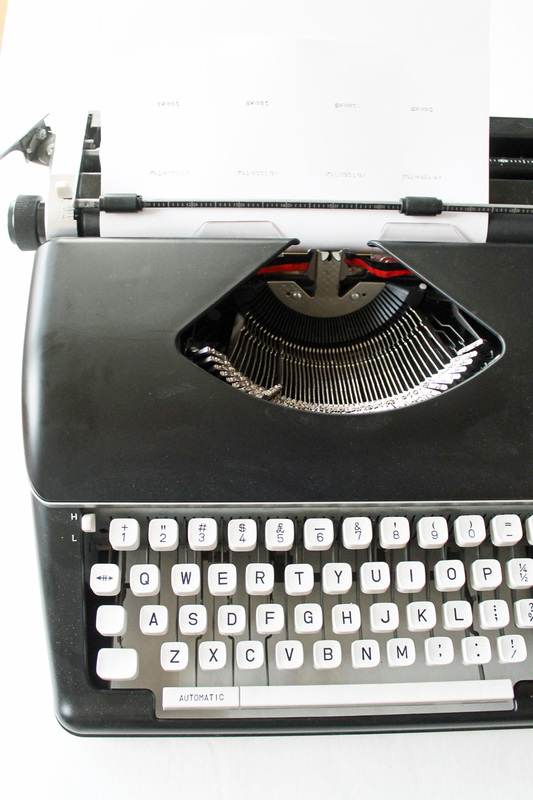 To make the course titles I used my Typecast Typewriter with gold ink and the Typecast Word Strip Stickers. 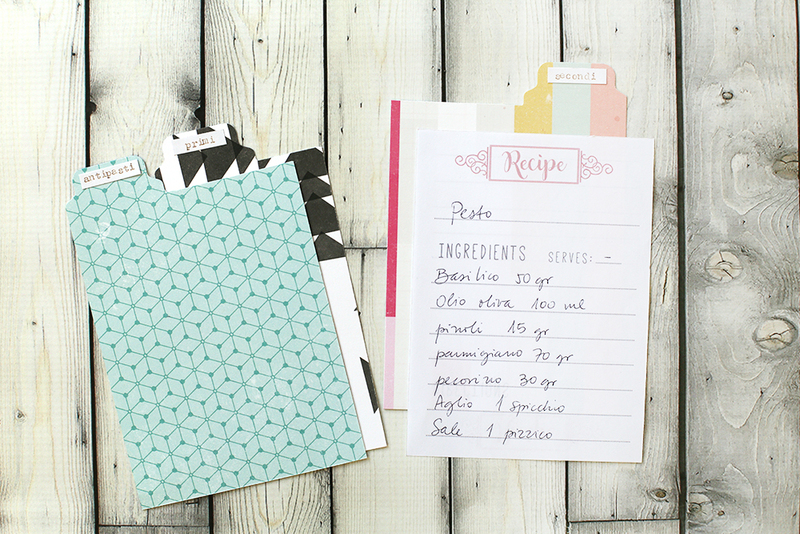 You can create your own recipe cards, or you can download the PDF below and print it on letter size paper. I assembled my box and included a title made with a Label sticker from the Typecast Collection. Here you can see the tabs and the recipe card. The board was so easy to use! 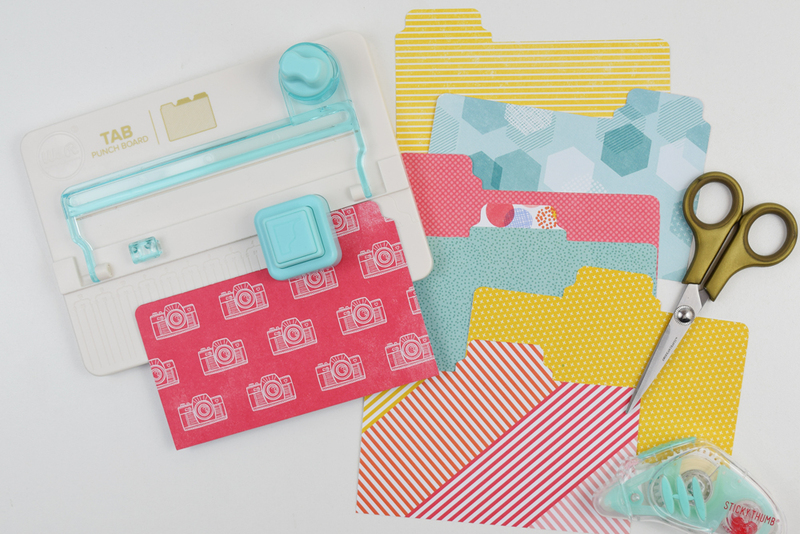 You can use it to create folders and organize your paper scraps too! Maybe that will be my next project! 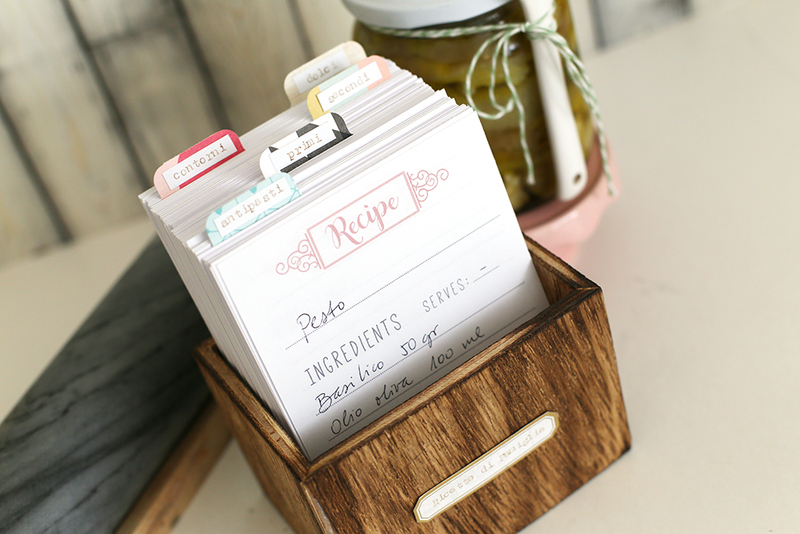 I am loving my new Recipe Box! Now I am sure I won’t miss any of those fabulous family recipes! Hello We R Fans! 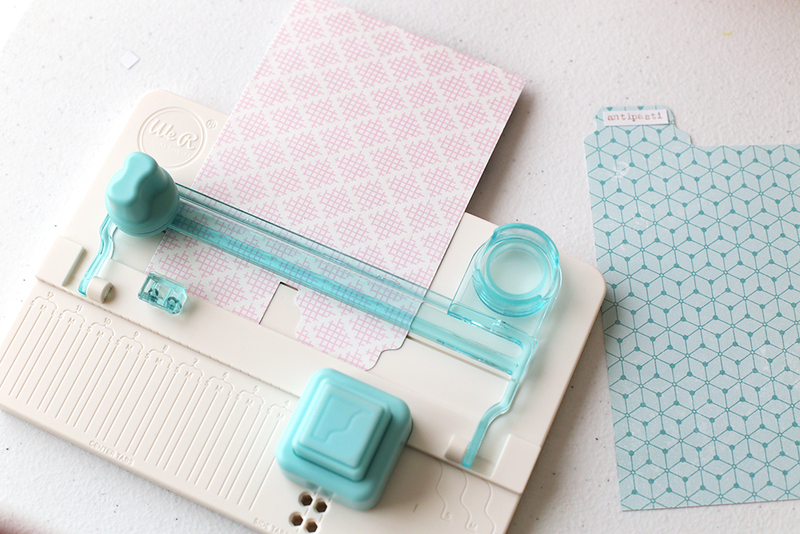 Kimberly here with a card using the Tab Punch Board. 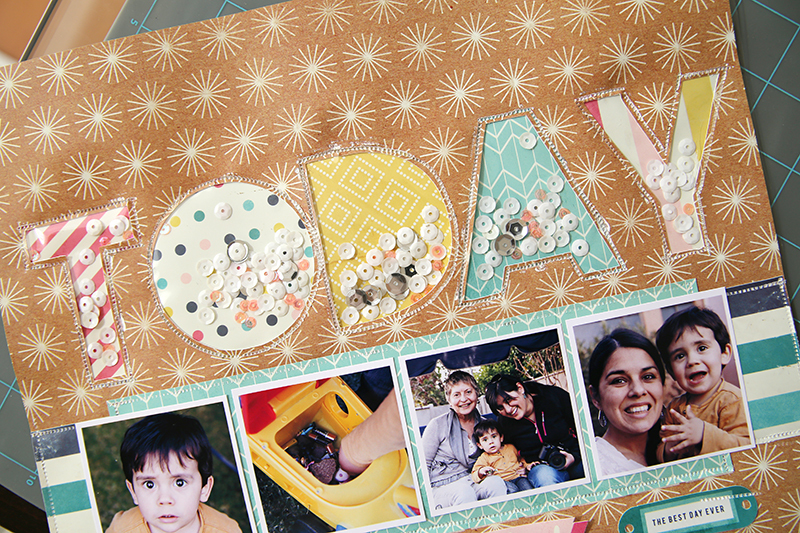 This is such a fun punch board! 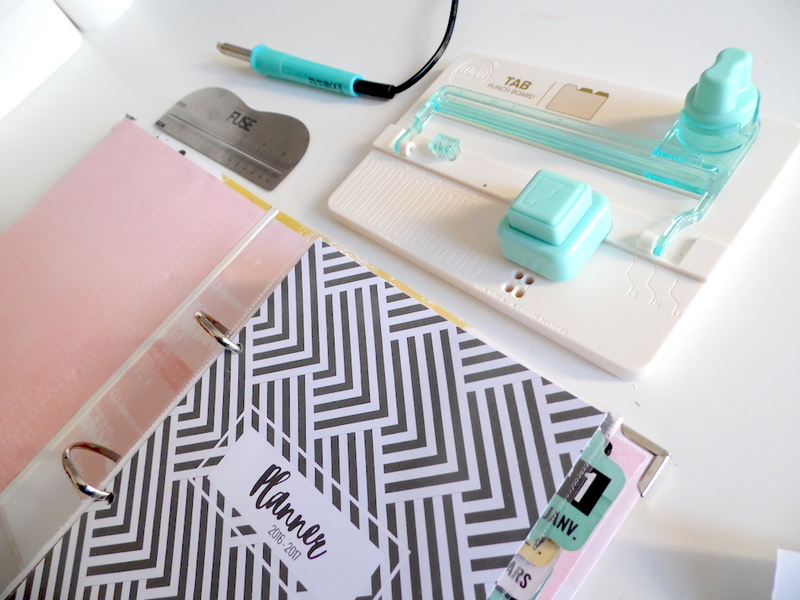 Not only can I make custom file folders to feed my organization obsession, but I thought I could make a darling file folder shaped card! 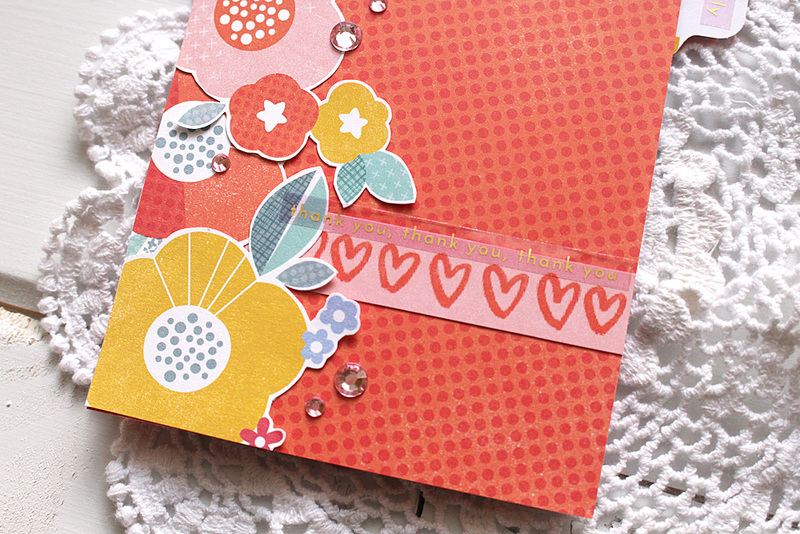 I decorated the front with fussy-cut flowers from the Good Morning paper from Oh Happy Life. 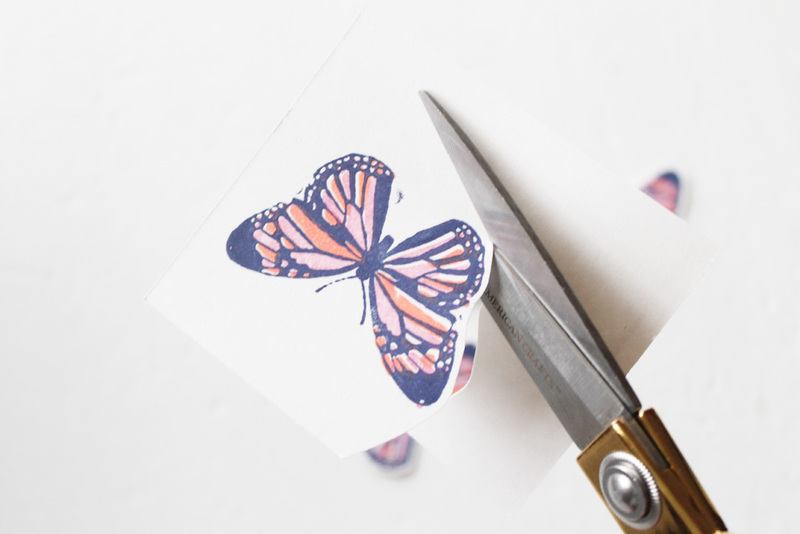 Fussy-cutting is when objects are cut out with scissors. 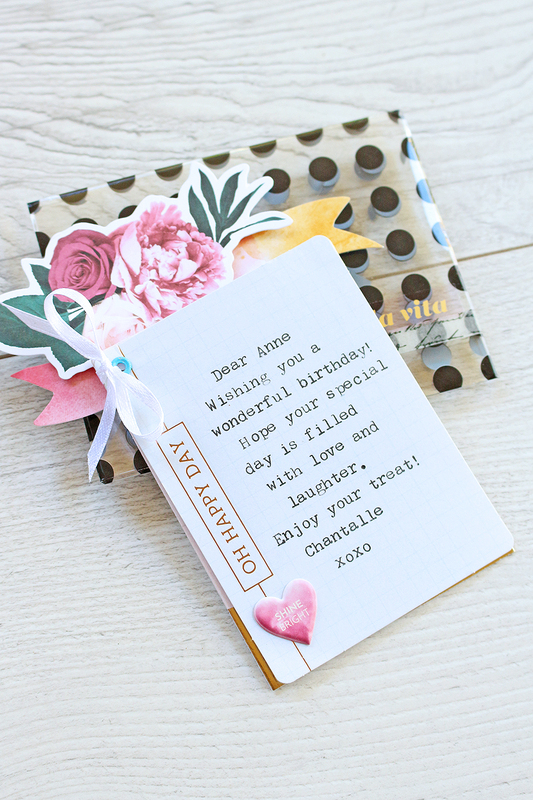 The gorgeous flowers on the patterned paper were perfect for this technique and created wonderful custom accents for my card! Some of the flowers were along the edge of the patterned paper, leaving a straight edge, instead of a full image. Those worked out to create a unique card front because I could place the flowers down the left side. 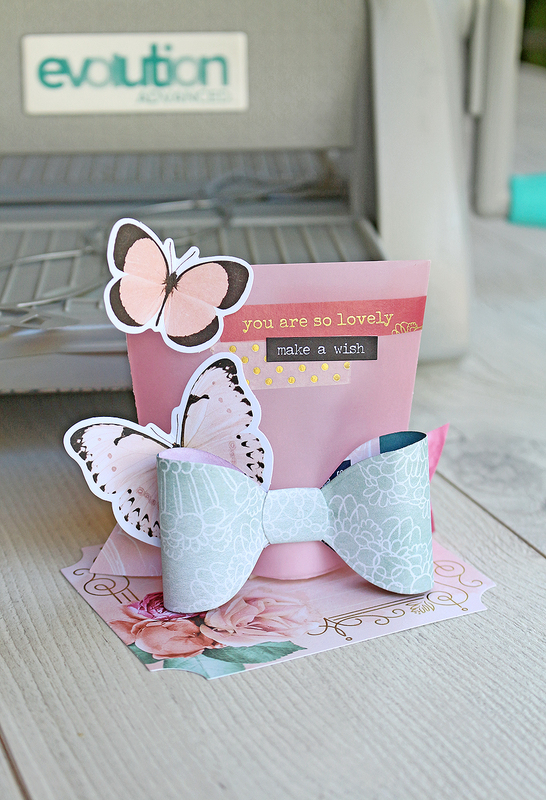 The front was finished with a small strip of heart patterned paper, a sentiment sticker, and a few rhinestones for shine. Check out how cute this tab is! 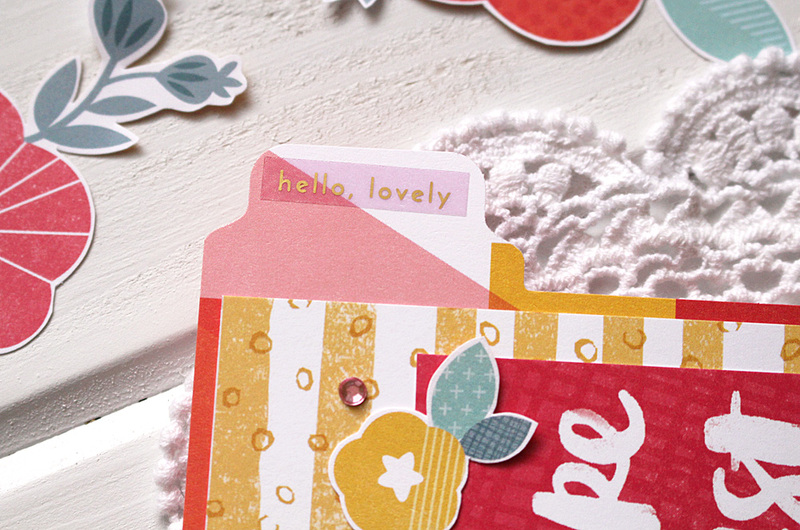 It was the perfect place to add another sentiment sticker, and allow the inside pattern to shine through as well! 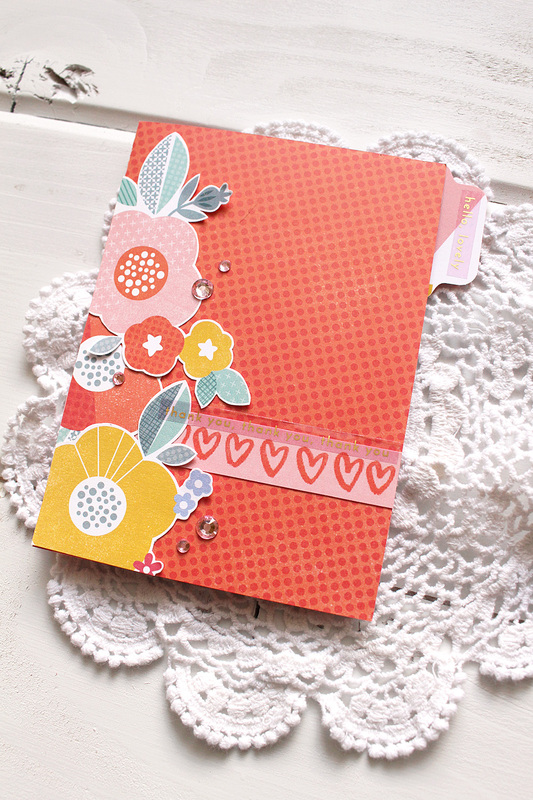 On the inside of the file folder card, I added more Oh Happy Life patterned paper, a sentiment cut from a journaling card, and a few more flowers. The yellow flower sits on the score of the card, so to allow the file folder card to still open and close, I simply placed the flower in the Trim and Score Board and scored it down the middle. 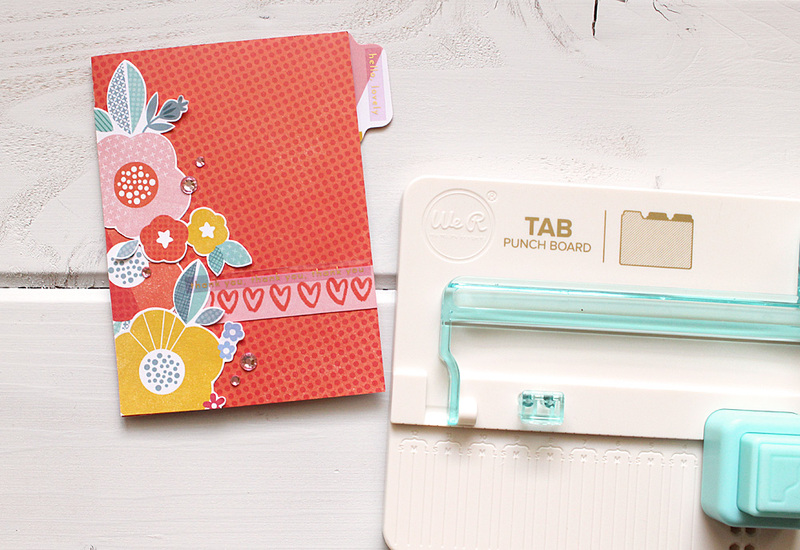 How will you use your Tab Punch Board? 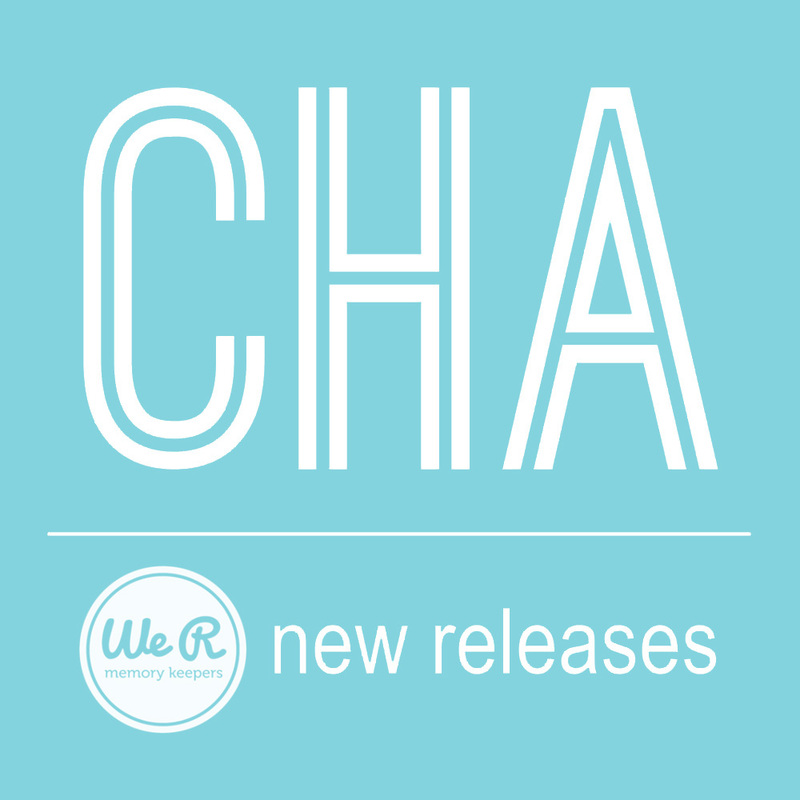 It’s countdown to CHA time friends, and we’ve got another round of awesome new releases for you today. We’ve saved the big guns for last, and we can’t wait to share them with you! 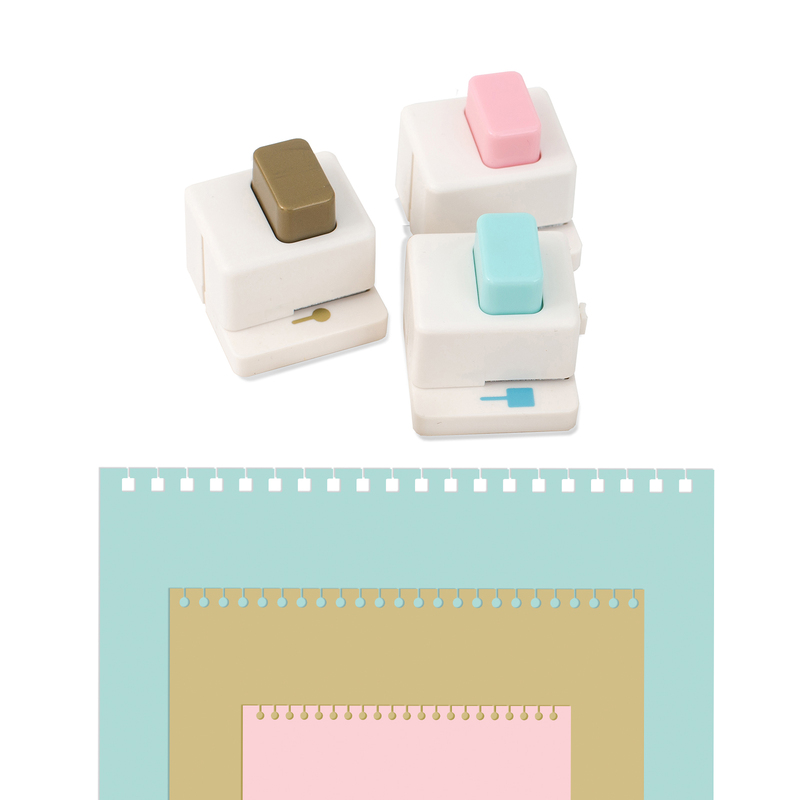 You’re going to love this set of dies that allows you to create fun, interactive elements on cards, layouts, and more for all occasions! This new Pop-Up Die starts shipping to retailers early in next month, so watch for it online and on shelves near the end of February. Calling all planner girls! You’re going to love this next one! 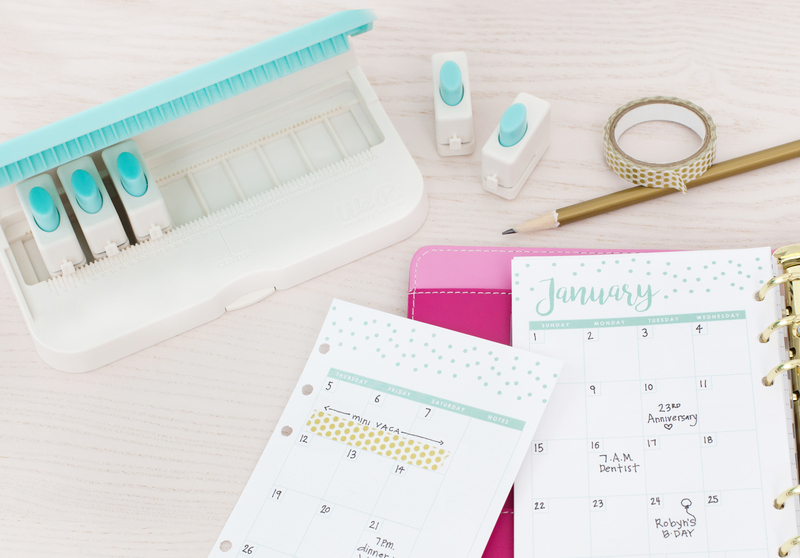 Punch holes for any planner to create custom inserts and pages. 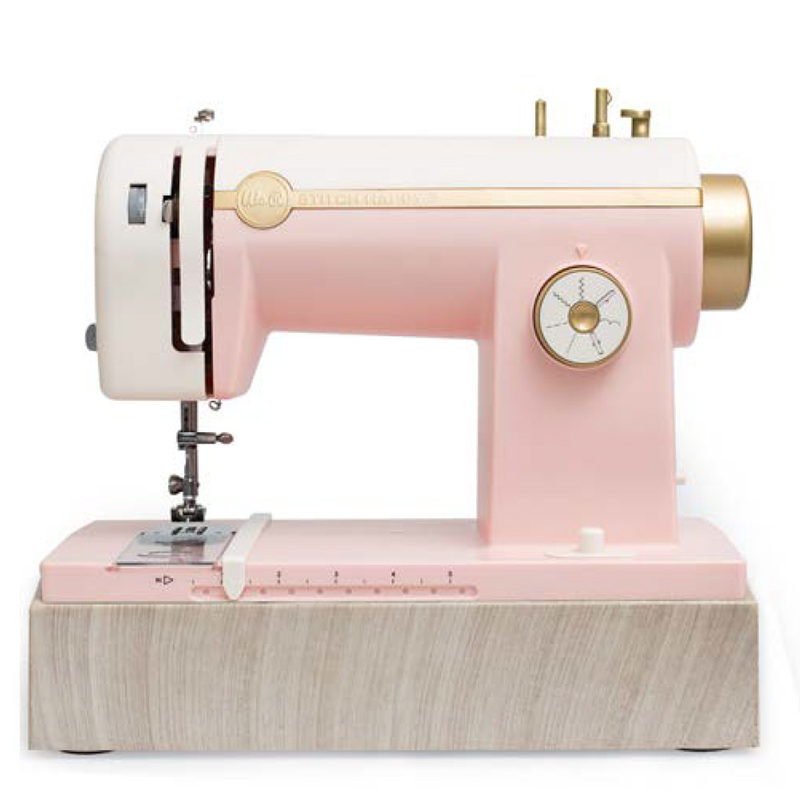 The Stitch Happy sewing machine comes in two stylish colors–pink and mint. 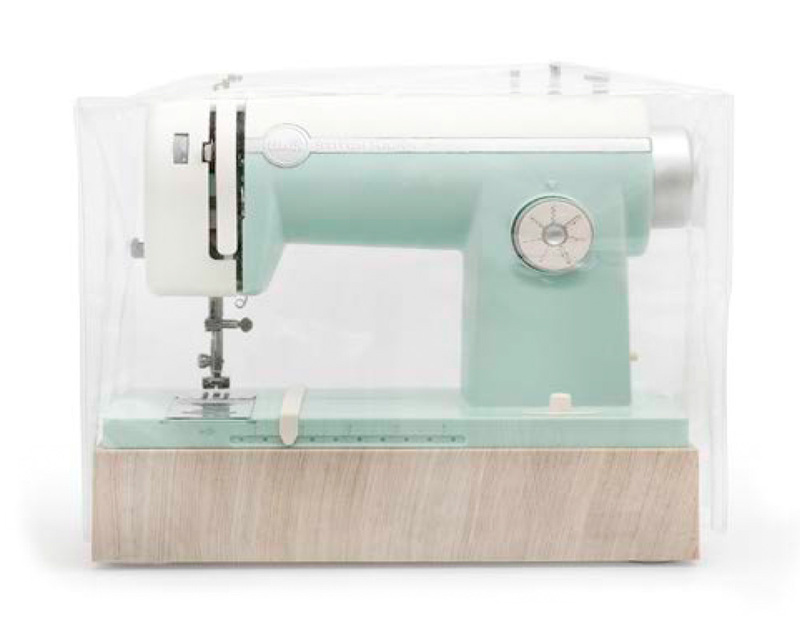 A clear dust cover for protection is sold separately. 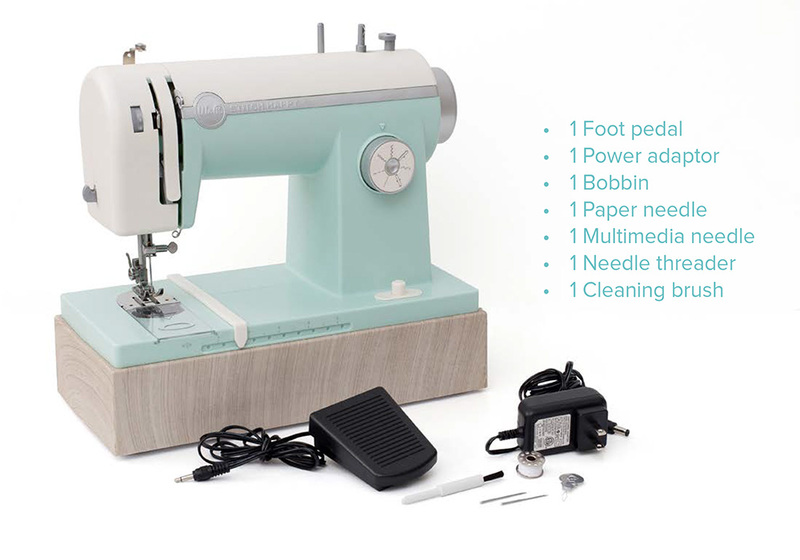 It’s engineered for thick floss, baker’s twine, metallic threads, and more. Enjoy increased motor power for multimedia projects. 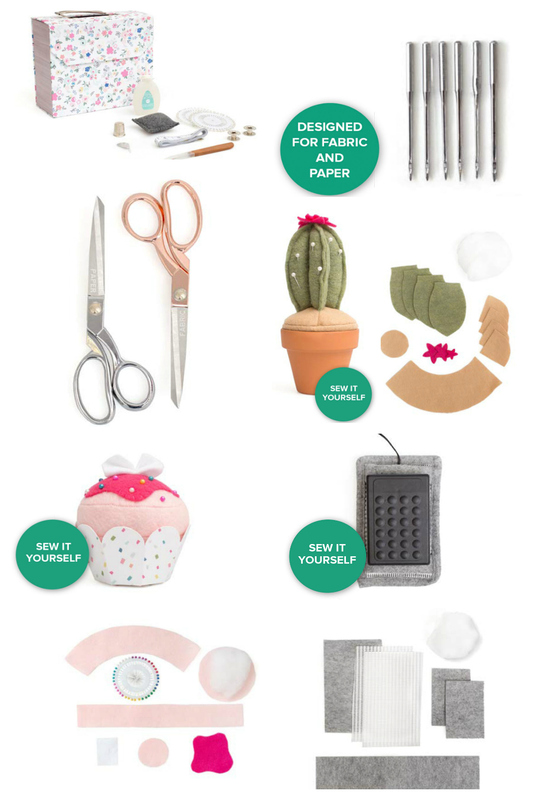 Purchase separate fabric & paper scissors, and use our convenient multi-purpose needles designed specifically for use with paper and fabric. No need to switch needles! 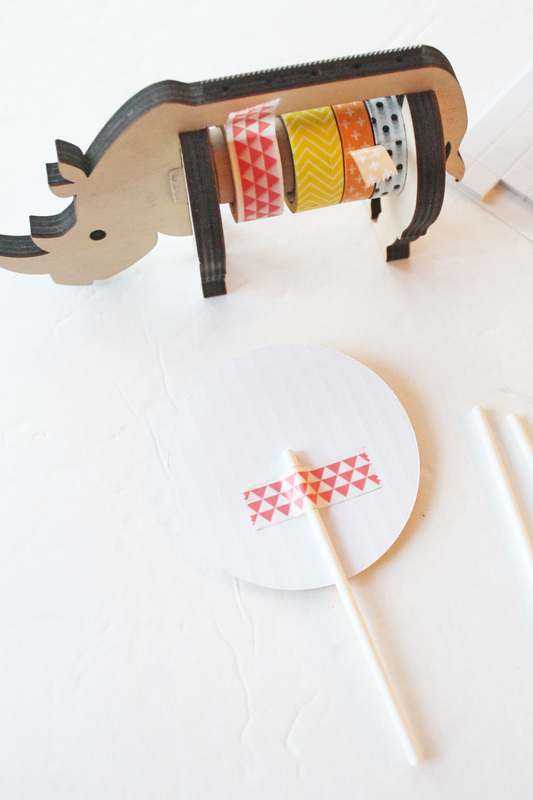 Plus you can purchase adorable multi-media project kits separately. Phew! That was a lot of exciting news, right friends! 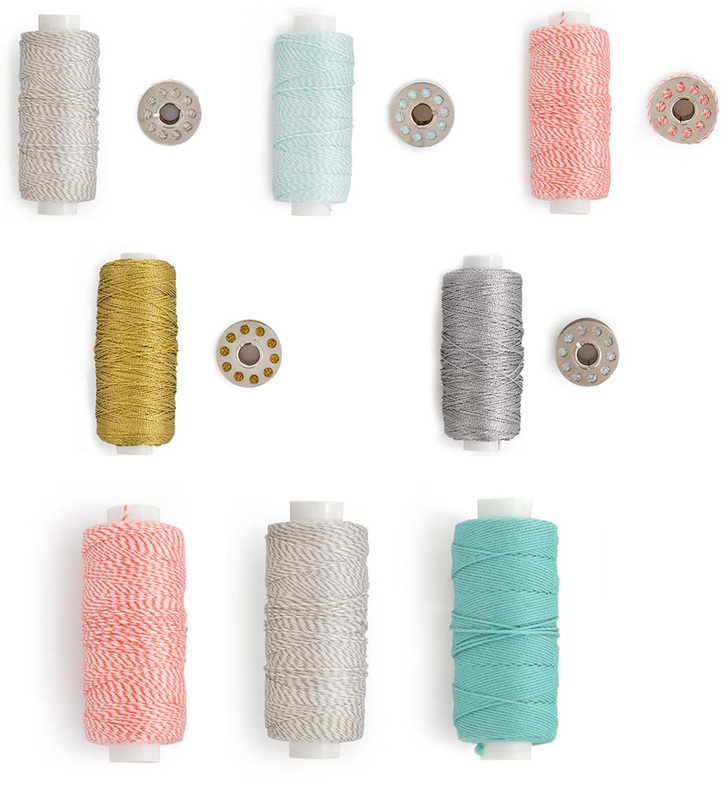 We can’t wait to share more about these awesome new releases, plus some project inspiration over the next few months, so keep checking back here and on our Facebook and Instagram accounts. 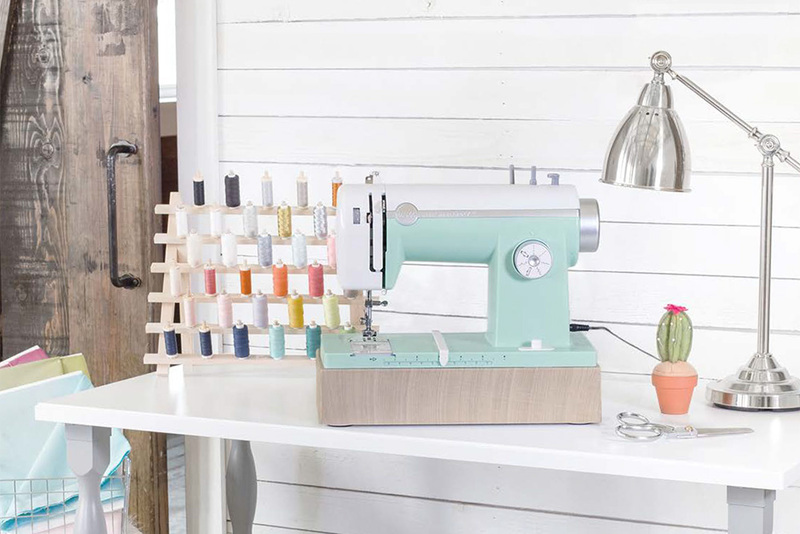 Alright, we want to know…which of these new releases has your heart all aflutter? 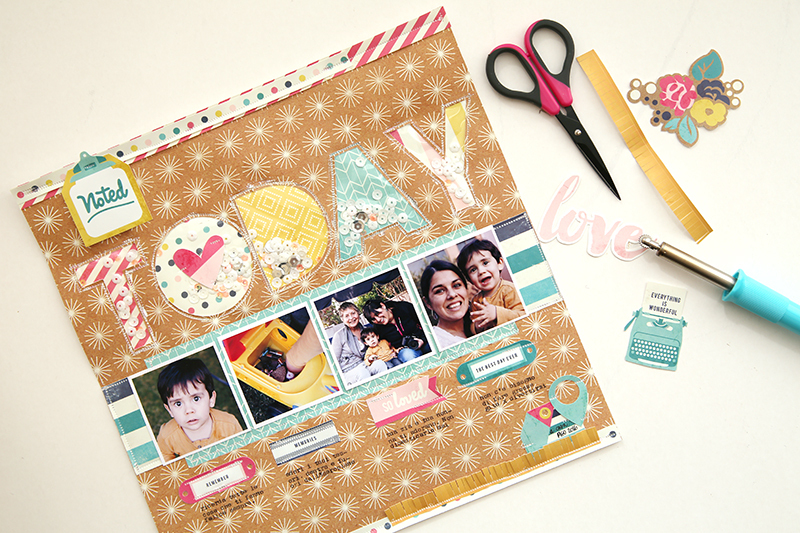 Hey there We R Memory Keeper friends, Becki here, to share a layout that I created with the Tab Punch Board. 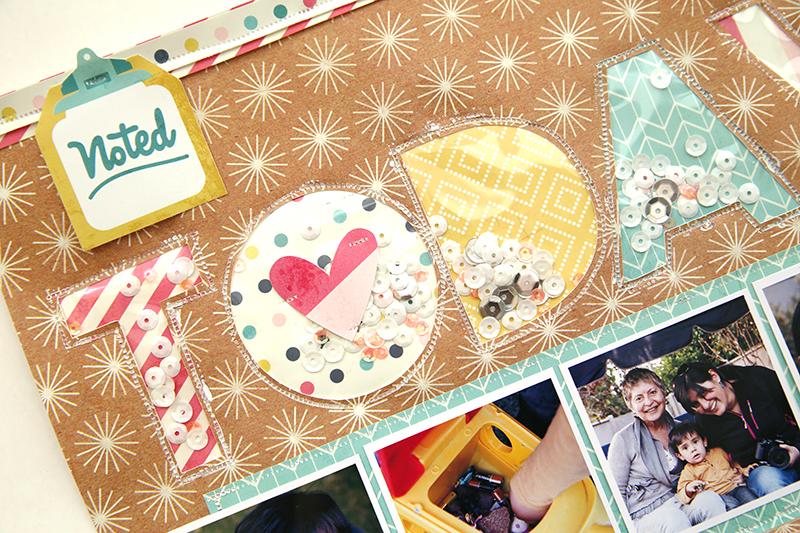 You guys, this punch board is my new favorite tool! 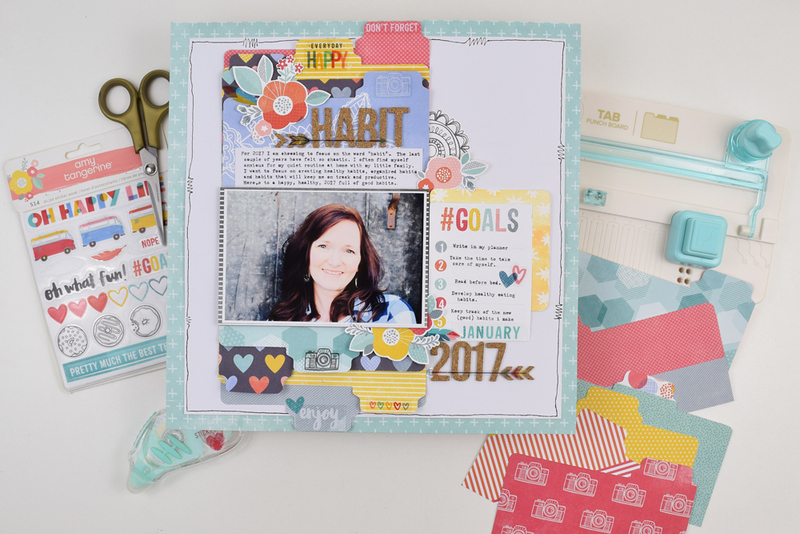 The layout I created to share with you today documents my word for 2017 and a few of the goals I’ve set surrounding my word. I started by cutting several 4×6 cards. Then I added tabs to the top of each card with the punch board. After I had my tabbed 4×6 cards created, I was ready to put them onto my layout. 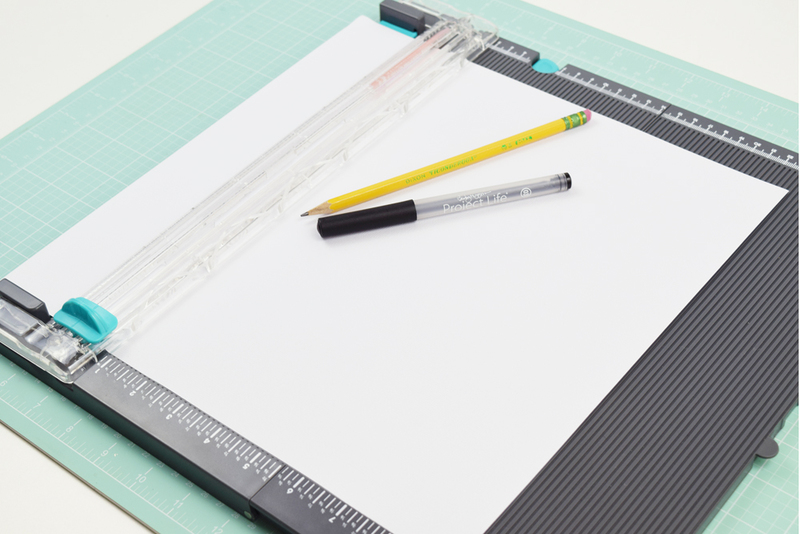 I used the Trim and Score Board to measure ½” lines on white cardstock. I layered four tabbed cards on the top portion of the layout and layered 4 tabbed cards on the bottom portion of my layout. I adhered my photo in the middle of the layered tabbed cards. 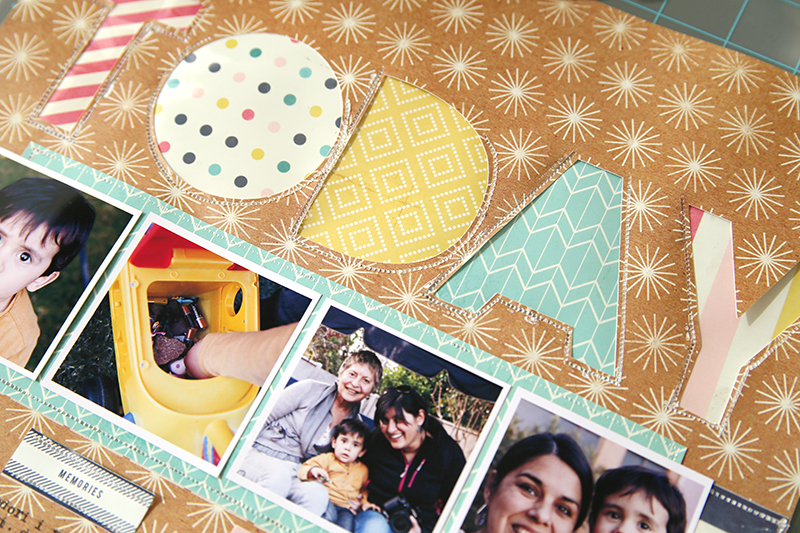 The brightly colored tabbed cards make the perfect layers to draw the reader’s eye to the photo. The title of the layout is my word “habit.” I added the title above the typed journaling above the photo. I used foam adhesive to give the tabs a little bit of dimension and texture. I wanted the tabs to come off the page a little bit. I also added a few stickers to the tabs to fit the theme of the layout. 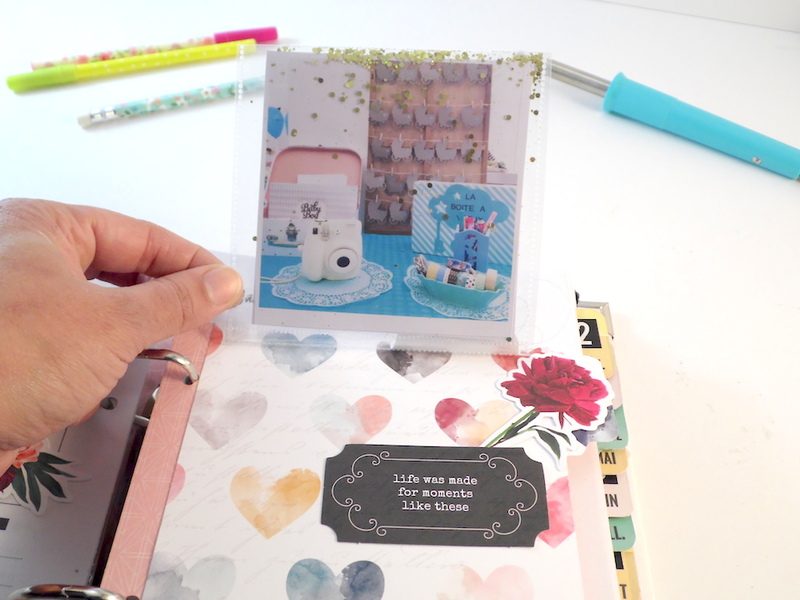 The finishing touch on the layout is a few fussy cut flowers that I tucked around the tabs and the photo. I can’t wait to add file tabs to many many many upcoming projects. I LOVE this little tool. I’ll see you again soon.